Our arrival in Córdoba didn’t go exactly as planned and reminded us, once again, that the travel gods have a sense of humor even if we don’t. We’d arranged a swankier than usual room at a small boutique hotel through hotels.com since one of our nights in the city would be free with their loyalty program and, following the hotel’s instructions, arrived mid-afternoon to check in. 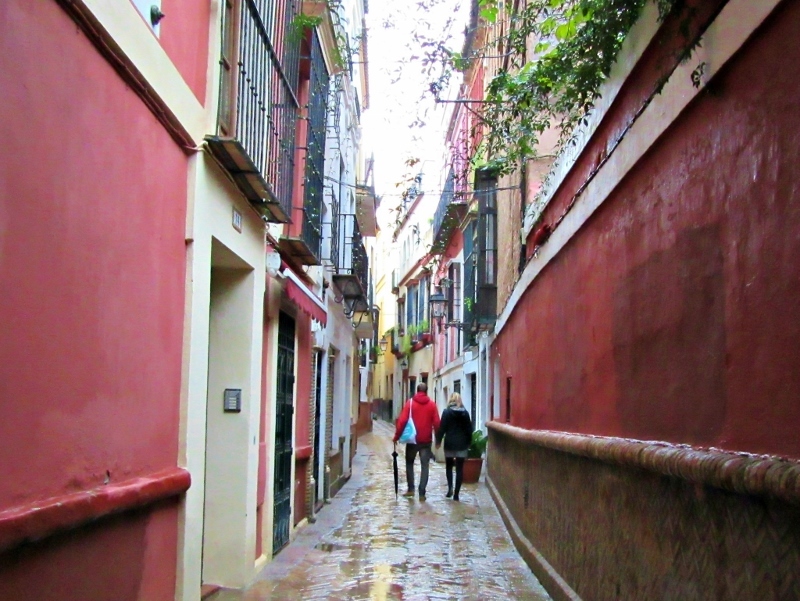 Since the hotel was in the historic part of the city, a maze of winding streets with many only wide enough for bicycles and pedestrians, the taxi driver dropped us off and pointed the way down a cobbled path. We found the correct address along a whitewashed wall of connected two-story residences, took hold of the heavy brass knocker, and rapped, a loud and hollow sound that seemed to echo down the narrow lane. We waited a bit and tried again (and again) with similar results. Finally giving up, thoroughly out-of-sorts, grumbling and dragging our overnighters behind us, we managed to plaster smiles on our faces as we asked for directions and followed the pointing fingers of a few helpful people until we found a street busy enough to hail a taxi. Fortunately, we had the name of a place to give to our driver, Hostal La Fuentes, where a friend of ours was staying. Now that the travel gods had had their fun, they decided to smile on us and we were happy to find a clean and comfortable room for three nights at half the price. A call by Skype to hotels.com resulted in the cancellation of our reservation and a refund of both our money and the free night to use in the future. Travel is a good way to remember that, contrary to our illusions and the plans we make, we really don’t have control over much! 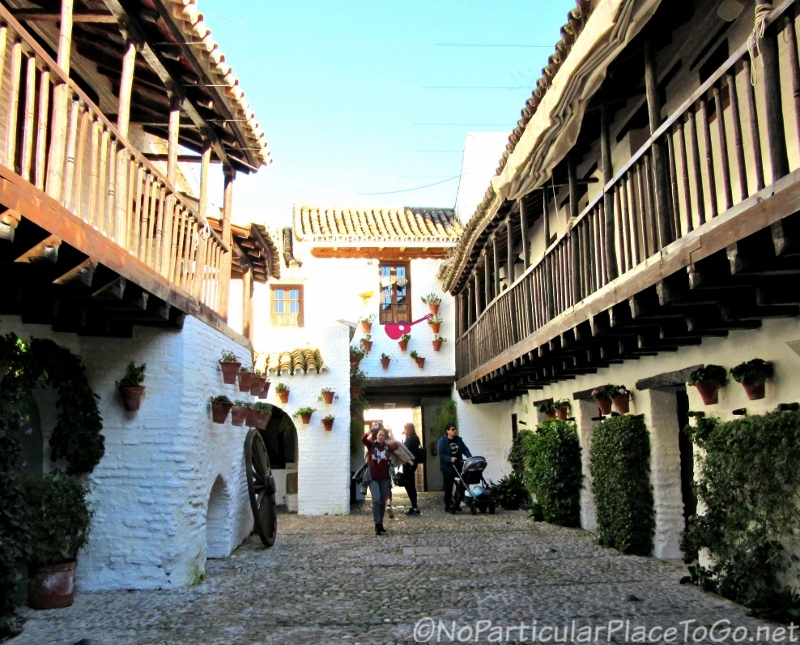 With the detail of where to stay for the next three nights resolved, we turned our attention to making the most out of our visit to the historic area of Córdoba. Its history stretches back over two-thousand years and includes a population who practiced three major religions: Islam, Judaism and Christianity. A UNESCO World Heritage Site since 1994, you can bet that the city has many fascinating stories to tell. 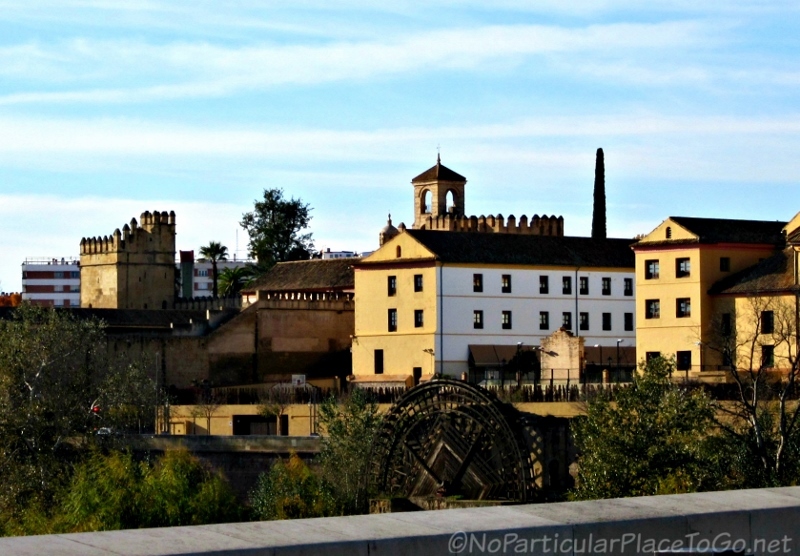 Once upon a time, Córdoba was a Roman city. 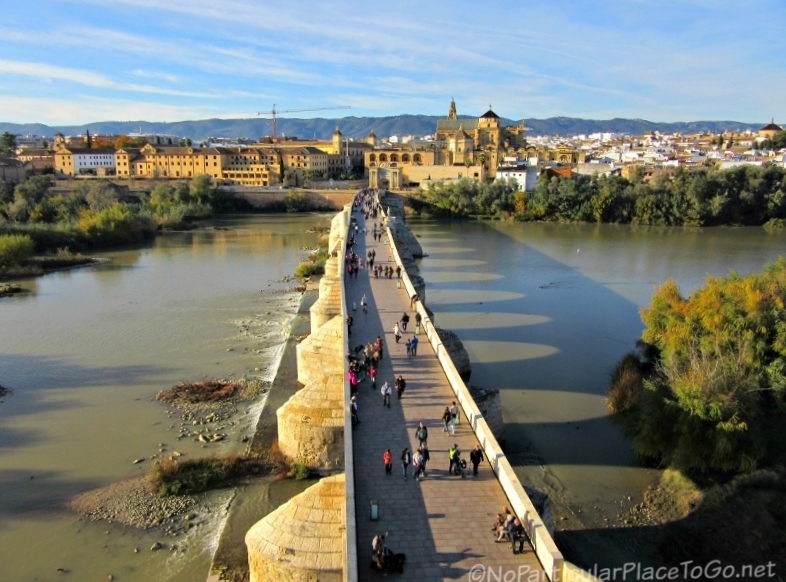 Founded around 152 BCE alongside the Guadalquivir River, the Romans constructed a wall around the city and built a bridge. 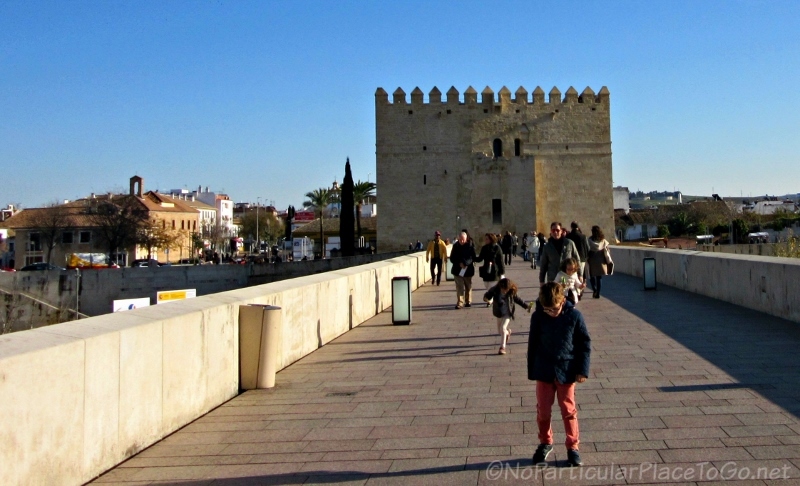 Known as El Puente Romano, the Roman bridge still spans the river and has been restored and renovated numerous times. 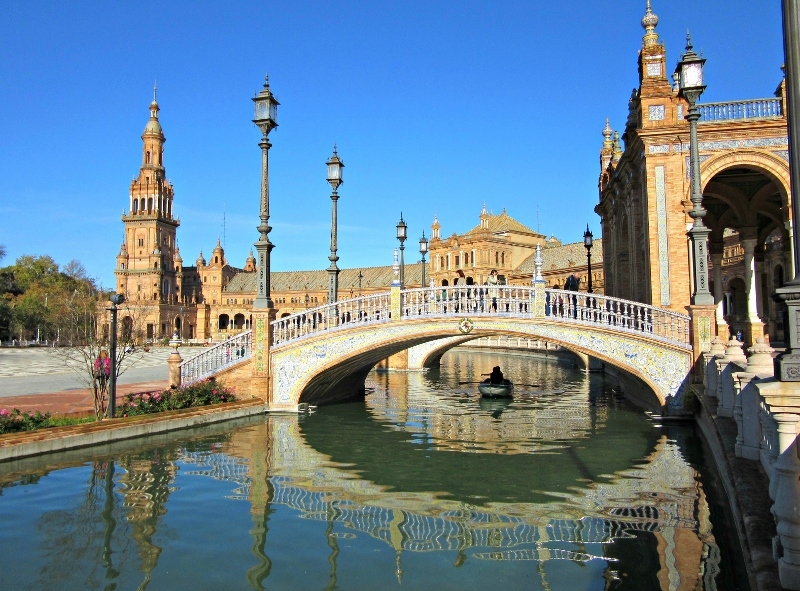 The Romans shipped Spanish olive oil, wine and wheat back to Rome and the city was the capital of the Roman Province of Hispania Ulterior (the southwest corner of modern Spain) which translates rather poetically into Further or Thither Spain. 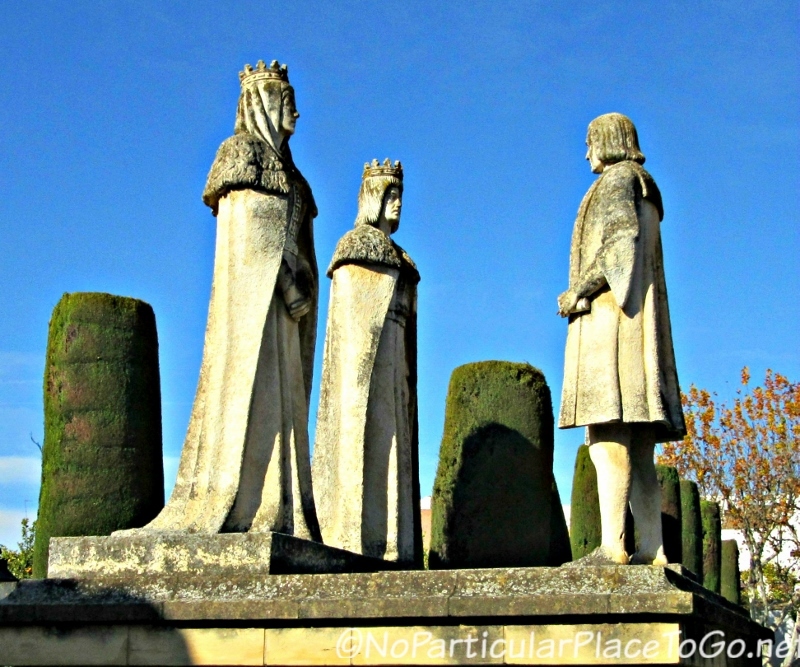 Once upon a time, Córdoba was ruled by the Visigoths. After Nero fiddled and the western Roman Empire collapsed, and despite invasions by several tribes of Germanic origin, Córdoba continued to flourish. The Visigoths brought Catholicism with them when they conquered the city in 572 CE and built a couple of churches over their relatively short rule of 150 years. 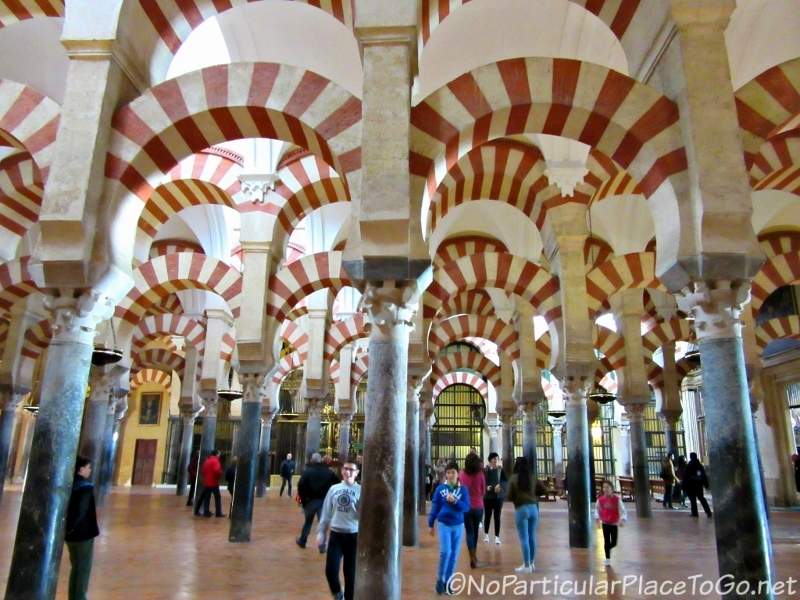 Once upon a time, Córdoba was a major Islamic center. The Moors invaded and conquered the city in 711 and occupied it for the next 525 years. 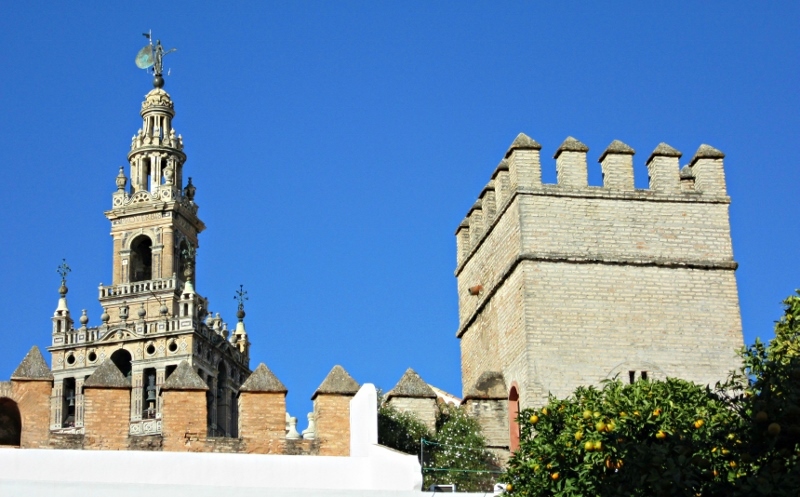 In its heyday, the city became the capital of the Caliphate of Córdoba, governing almost all of the Iberian Peninsula. 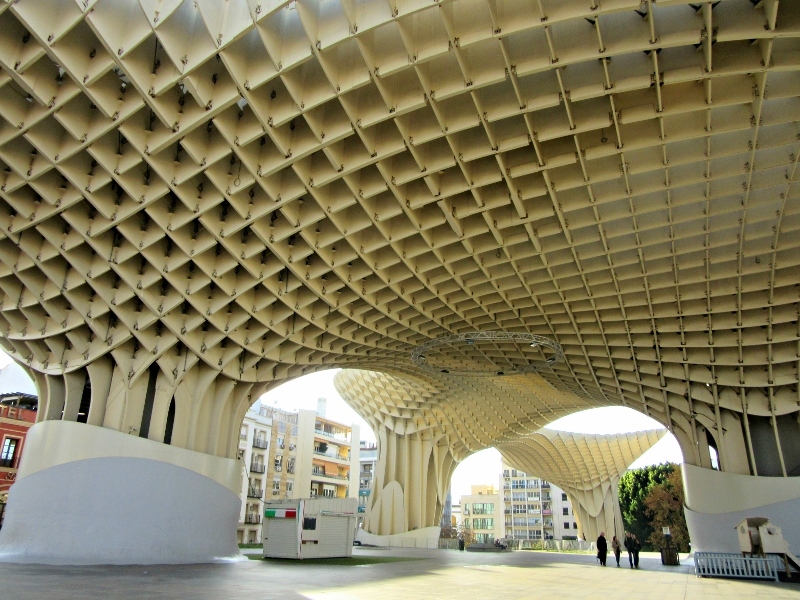 As one of the largest cities in the world with a population estimated around 450,000, as well as one of the wealthiest in Europe, Córdoba was a haven with a reputation for progressive thought. Here, Muslims, Jews and Christians coexisted, more or less amicably, in a spirit of religious tolerance. 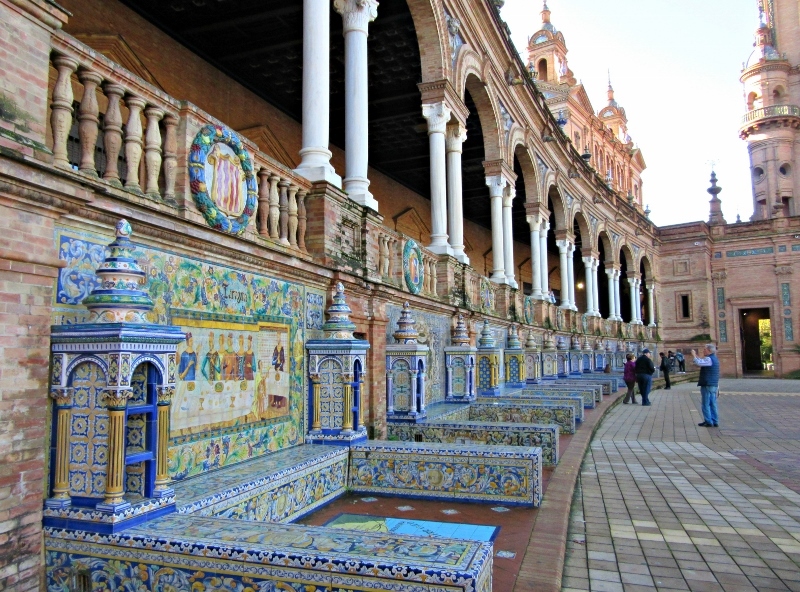 During this time, the city became a center of Moorish philosophy, architecture, mathematics, arts and poetry. And thriving alongside the Muslims, the Jewish community also became an important seat for Jewish scholarship, medicine, learning and culture. Perhaps most notably for us travelers, this was the era of some of the Moor’s greatest architectural glories. 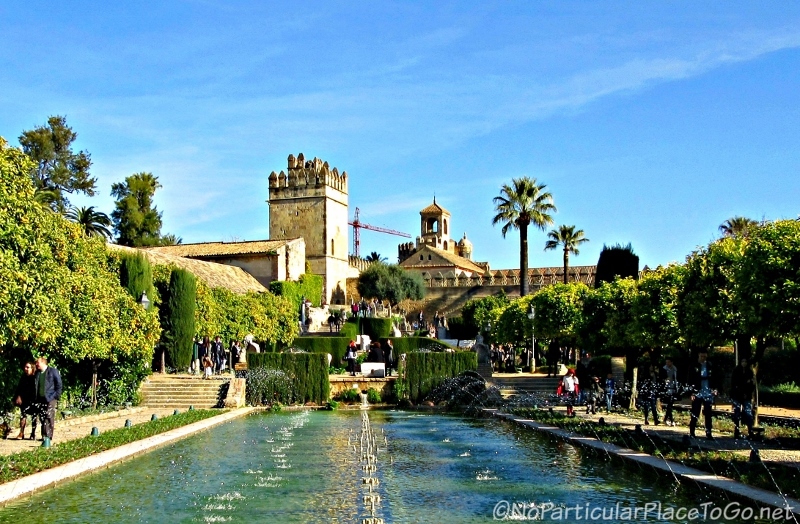 The Alcázar de los Reyes Cristianos or Royal Palace is an enormous complex with multiple towers and a fortress begun in 785. 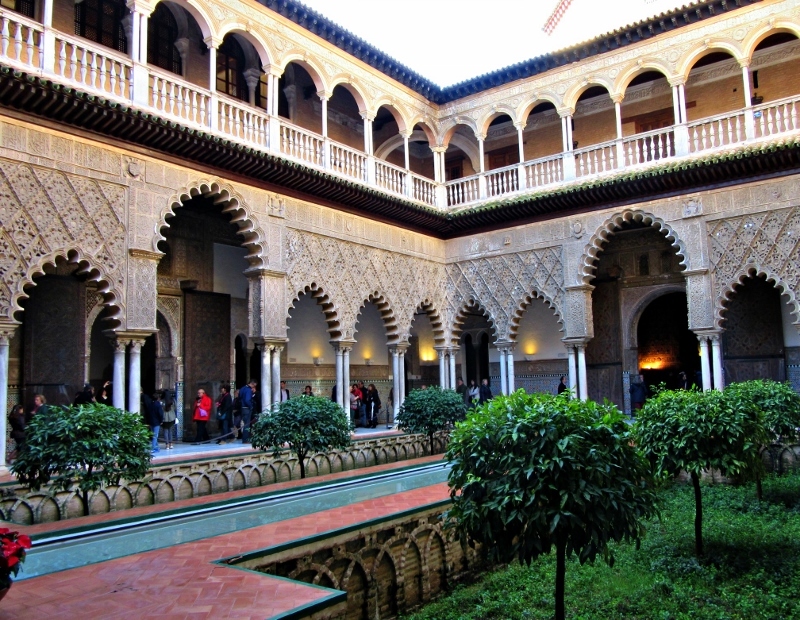 It has a complicated history beginning as the home for Caliphs (leaders of the Muslim community), Spanish Kings and Queens, the Headquarters of the Spanish Inquisition, a garrison and military prison as well as a civil prison. Now a national monument, it’s not hard to imagine the history that played out within its maze of mostly empty rooms, halls and towers. Outside, are the patio and magnificent gardens laid out in three terraces with ponds and fountains, boxwood hedges, cyprus and citrus trees and flowers, few of which were in bloom since it was winter. 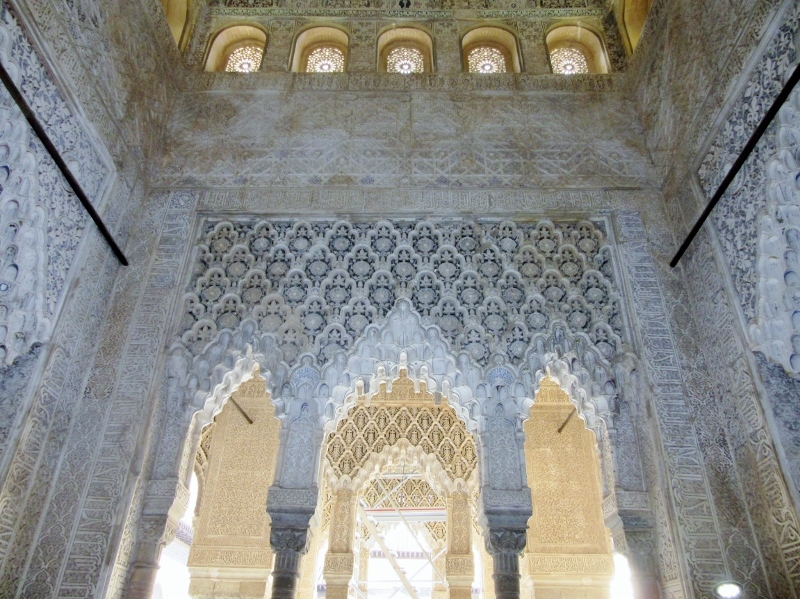 Construction on The Great Mosque of Córdoba (now called the Mosque-Cathedral) began in 784 and continued over two centuries. 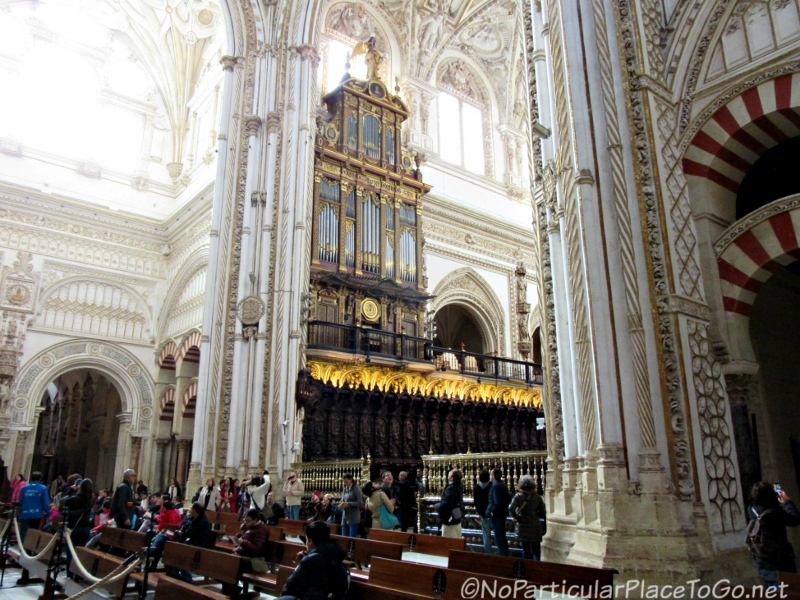 Without a doubt, the most stunning religious monument we’ve ever seen; we devoted our last post to this magnificent building that you can find here. A reconstruction of the Albolafia Water Mill (1136) is next to the Roman Bridge on the northern bank of the River Guadalquivir. 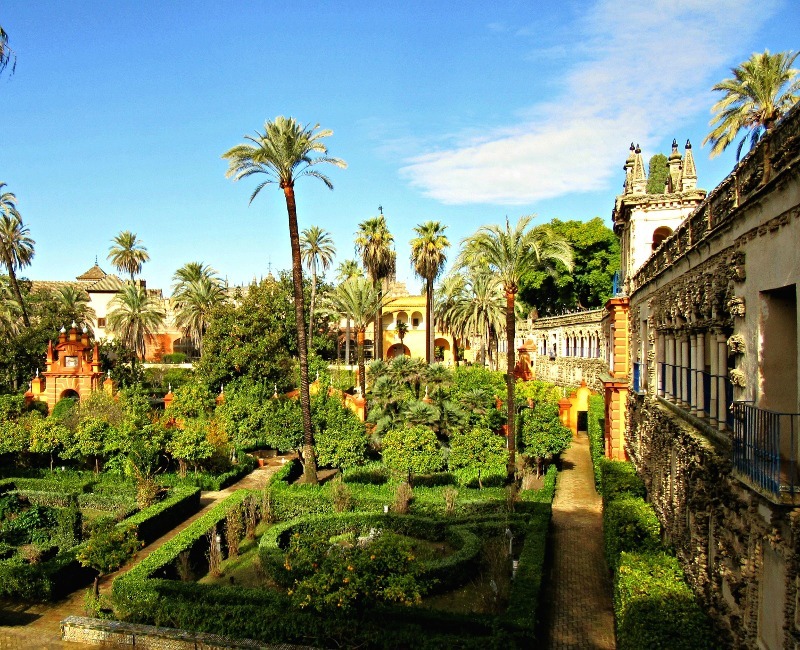 Water was drawn up by a chain pump and carried through a series of aqueducts to the Alcázar Palace Gardens. 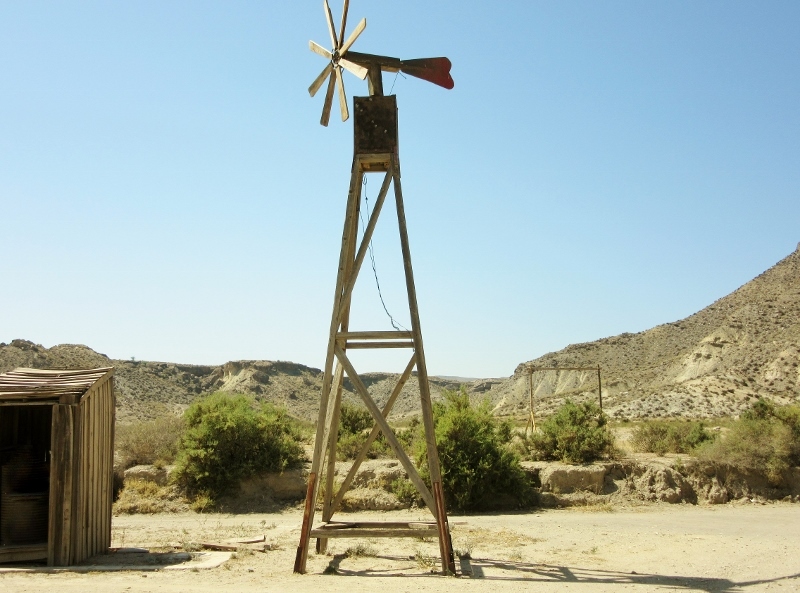 Legend has it that Queen Isabella ordered the water wheel dismantled since its noise disturbed her. 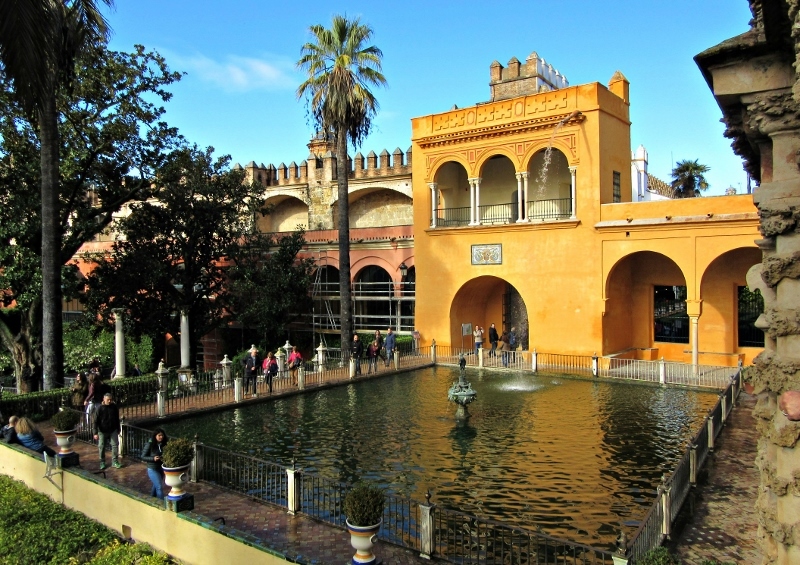 The Caliphal Baths, also known as the Arab Baths, were built in the mid-tenth century and are adjacent to the Alcazar. The pools reproduced the Roman series of cold, warm and hot water baths and were an important part of social life as well as the ablutions and ritual cleansing mandatory before prayer in the Islamic religion. 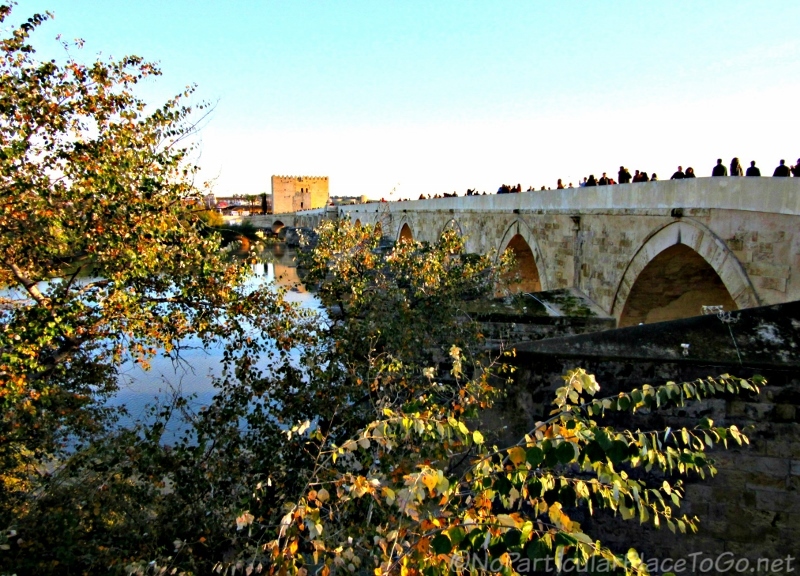 The Tower of La Calahorra, the oldest defense building in the city, is located on the far side of the Roman Bridge. 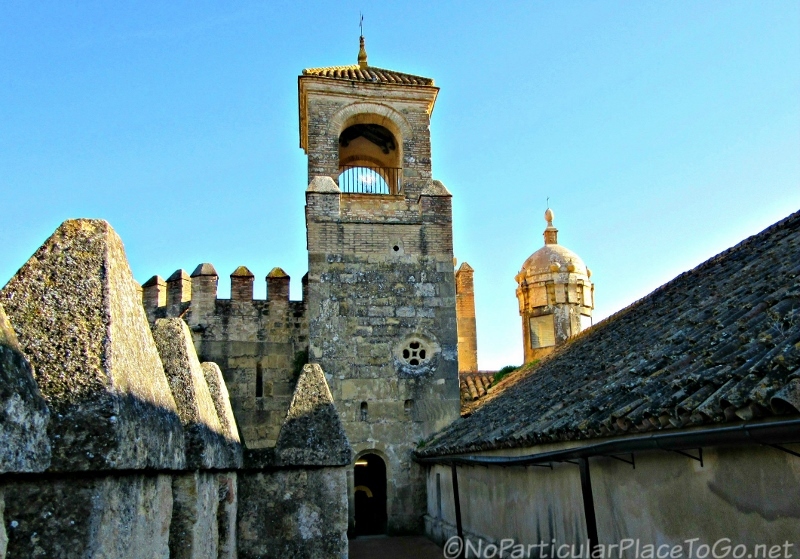 Built towards the end of the twelfth century as an arched gate between two square towers, a third cylindrical tower was added a couple of centuries later and connected the original towers for additional fortification. Past use has included a prison as well as a school for girls (an eyebrow-raising perspective on a previous educational system) and currently it houses a museum with interesting exhibits of Cordoban life and history. 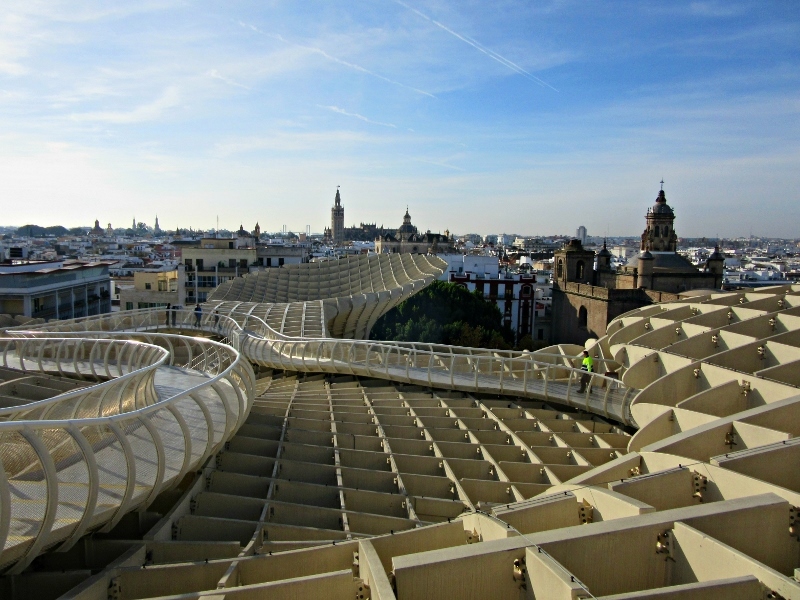 A climb up to the roof is worth the effort as there are spectacular, panoramic views of the Roman Bridge, the city and the Mosque-Cathedral. And here is where they launched the Spanish Inquisition, lasting over three centuries, that strengthened the Church and enriched its treasuries. 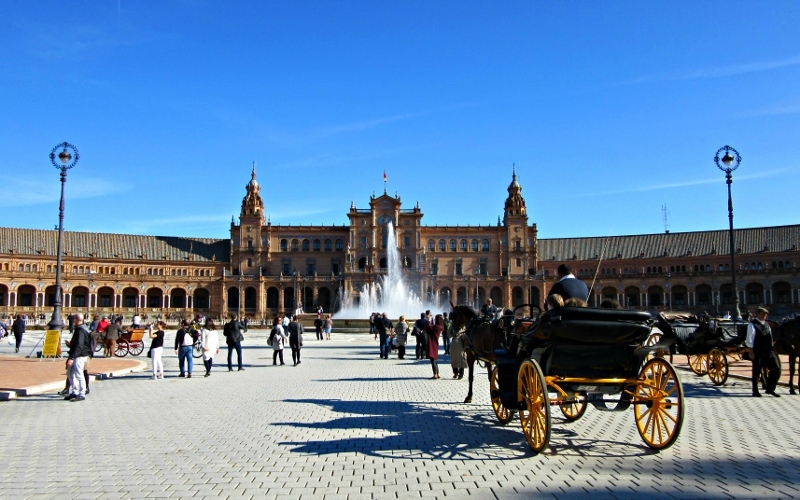 The Royal Palace was converted into a tribunal with interrogation and torture chambers and many of its first victims were the Moriscos and Conversos. Note: We don’t usually say to flat out avoid a museum but that’s what we recommend regarding the Gallery of the Inquisition. This horrifying museum is located in the heart of the historic Jewish quarter (the Judería) and has several rooms filled with various implements and devices used in the Inquisition that are designed to inflict the maximum amount of pain, cruelty and humiliation upon its victims. Many methods of torture made burning at the stake a favorable alternative. 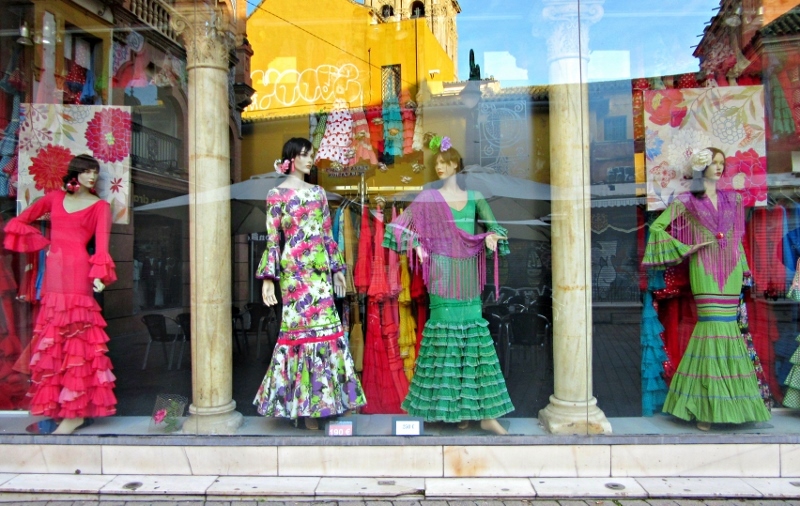 Once upon a time, and over the next few centuries, Córdoba became something of a cultural backwater. 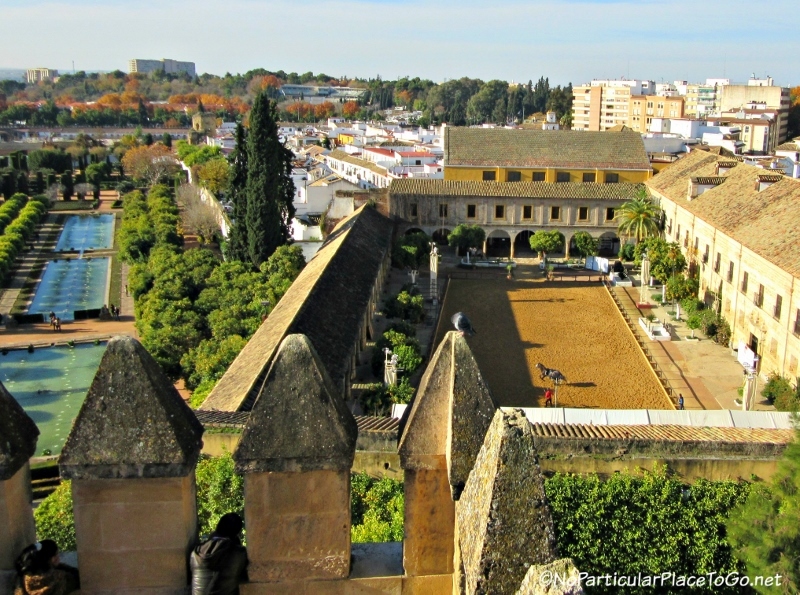 Although Spain was at the peak of its power, Córdoba retreated into the background and many of its buildings fell into decay with little business or commerce to entice new residents. 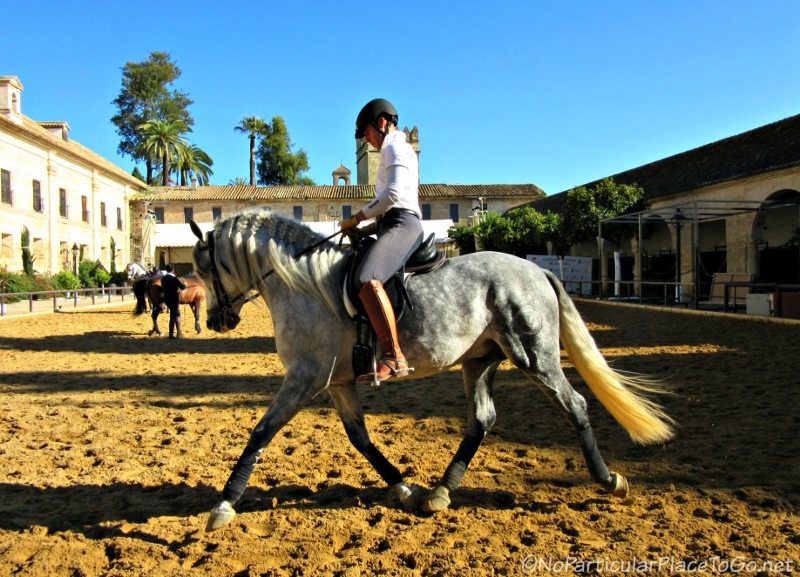 The Caballerizas Reales de Córdoba, translated as the Royal Stables, are located next to the Alcázar and were built in 1570. 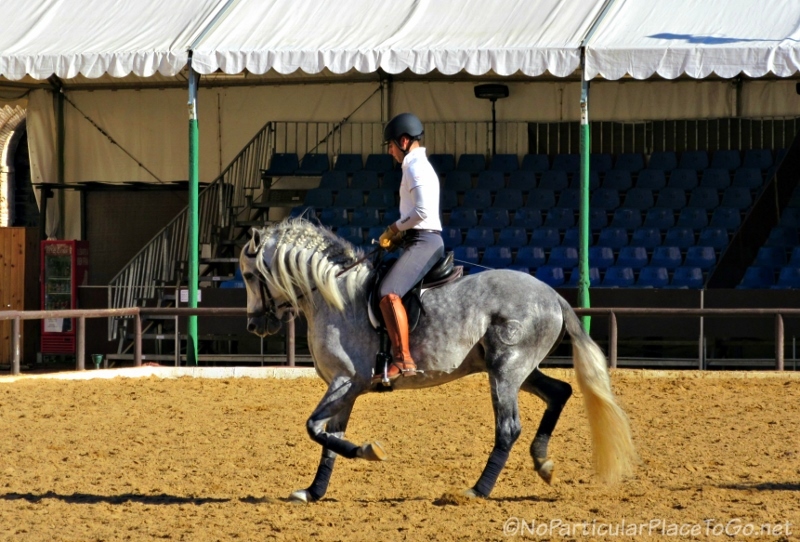 Home to the magnificent Andalusian horses, we devoted a whole post about these magnificent animals here. 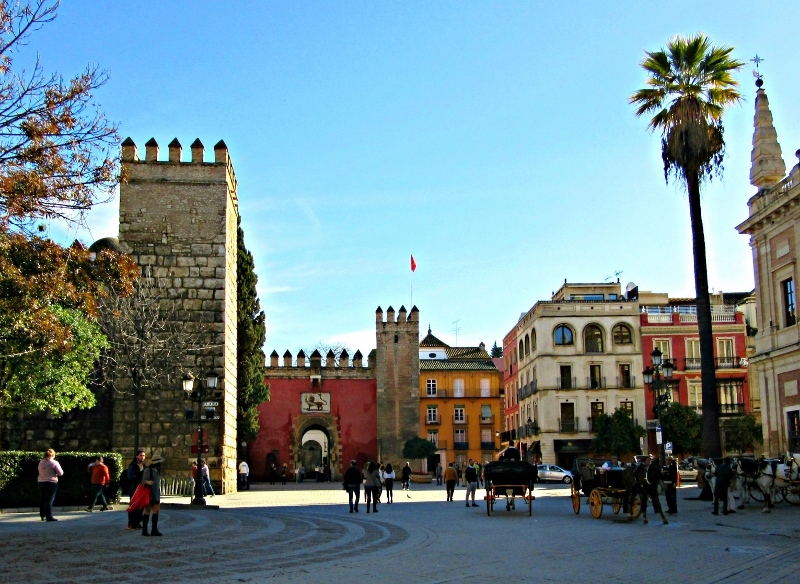 Puerta del Puente or Gate of the Bridge was built in the late sixteenth century (circa 1576) in an urban renewal project and effort to spiff up the city with a ceremonial gateway. 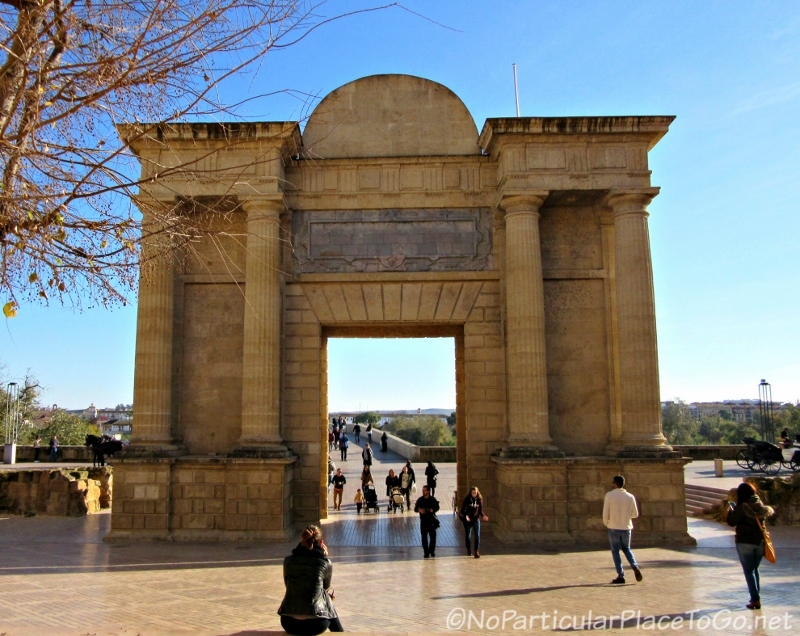 Located at the opposite side of the Roman Bridge from the Tower of La Calahorra, the gate is a beautifully elegant structure built in the Renaissance style. 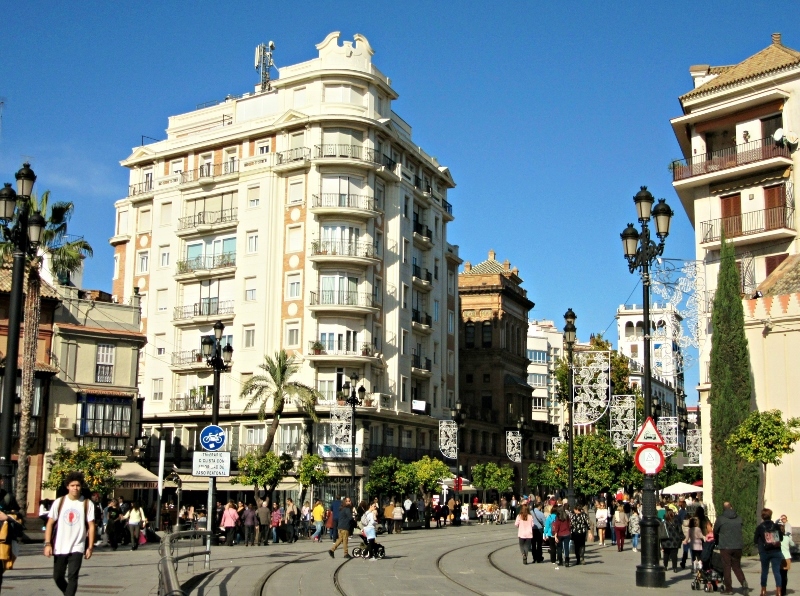 The Plaza del Potro is one of many public squares in Córdoba. 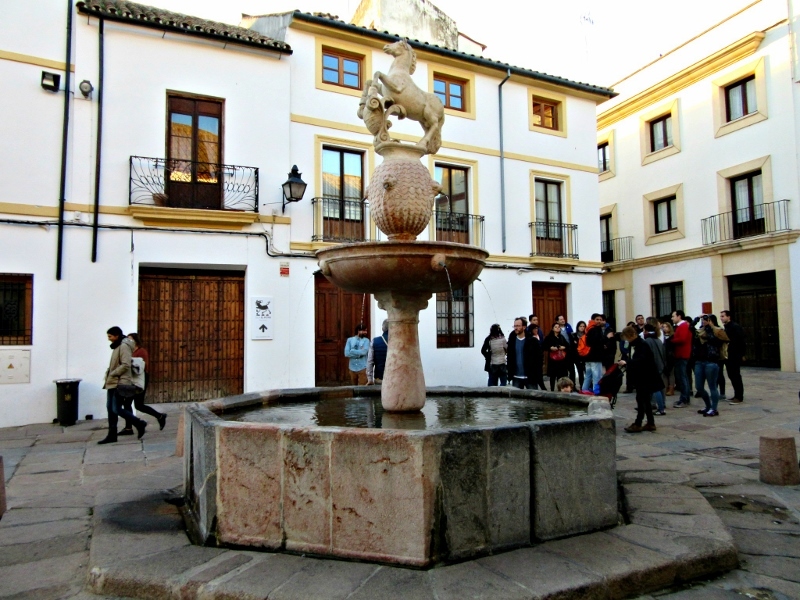 Once a horse market, the plaza has a Renaissance fountain dating from 1577. 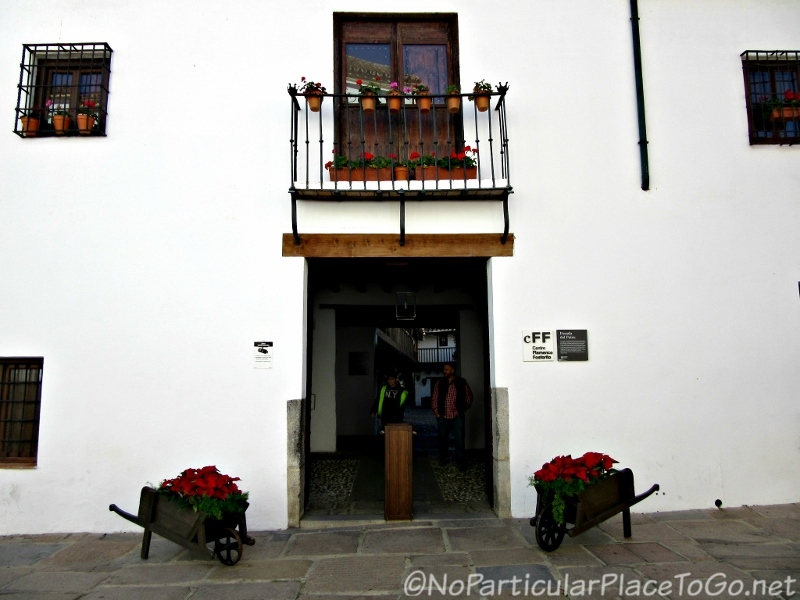 Off the plaza is the Posada del Potro, a legendary inn described by Cervantes in his book, Don Quixote (1605) as a “den of thieves.” The inn is now home to the Centro Flamenco Fosforito, a museum which has the reputation as “possibly the best” flamenco museum in Andalucia. 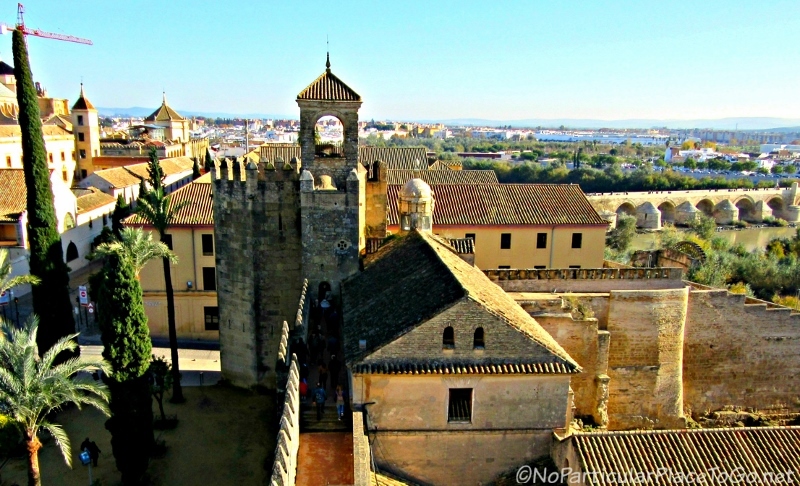 Once upon a time, Córdoba was sacked by Napolean. During the Napoleonic Wars, the “Nightmare of Europe” fought Spain, Britain and Portugal for control of the Iberian Peninsula. His armies sacked the city (1808) and for a time were garrisoned in the Alcázar. 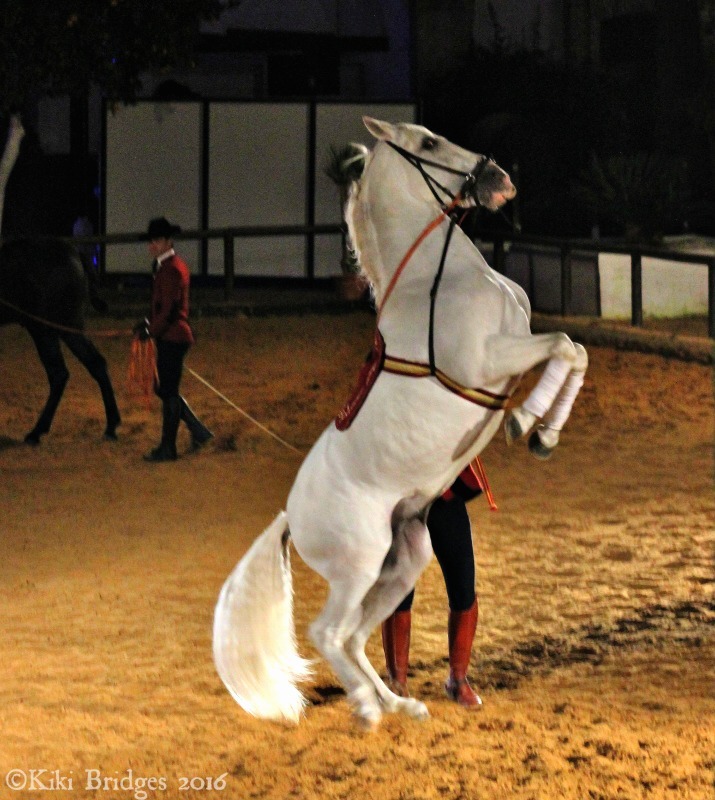 Before leaving Córdoba, they seized the Andalucian horses, long prized for their reputation as adroit war horses, to use in their own invasion, which almost led to the demise of the breed. Once upon a time, Córdoba sided with Franco early (1936) in the Spanish Civil War. Someday we hope to delve into this subject but for now, it’s definitely another topic and trip. And they lived happily ever after …. Well, maybe not all the time but our visit had us describing the city in long lists of superlatives to friends and trotting out the words “picturesque” and “charming” way too often. 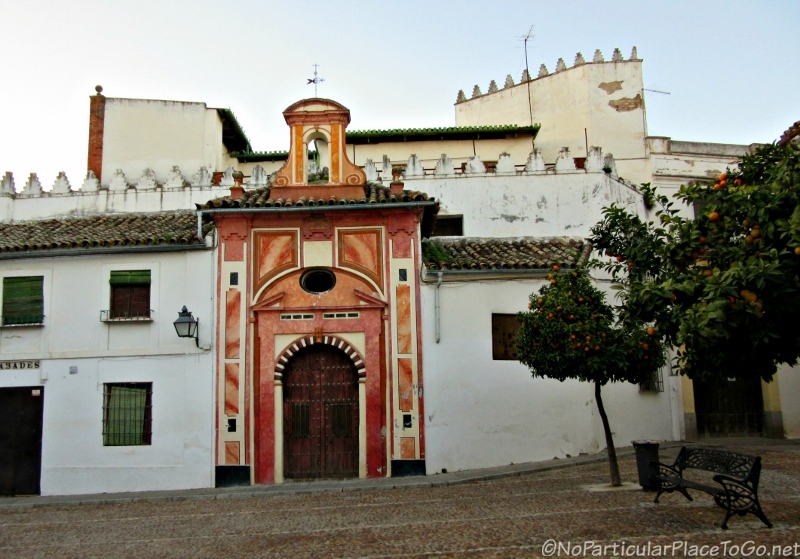 Córdoba is a city that had us at hello and left us with the feeling that we had to say goodbye too soon. 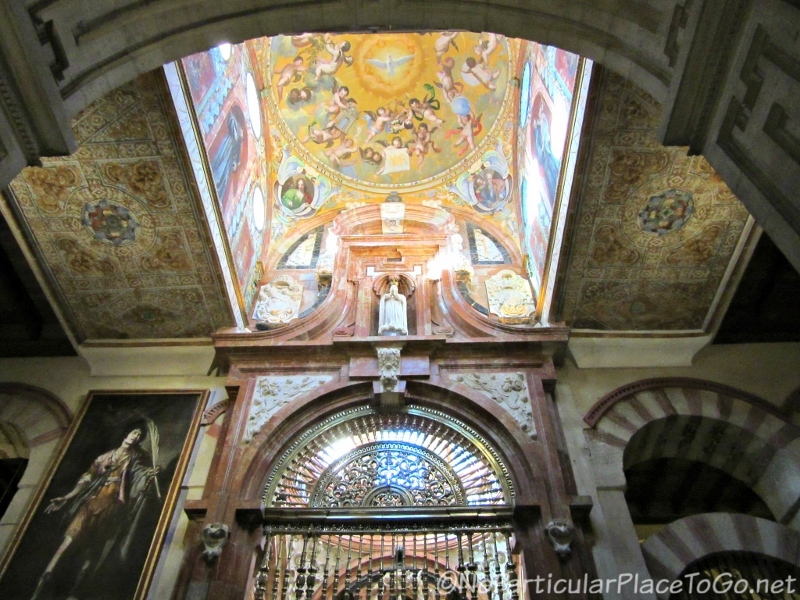 Ever since we’d seen pictures of the Mosque-Cathedral of Córdoba, aka the Mezquita-Catedral de Córdoba, we’d known that it would be at the top of our “must see” list when we returned to Spain. Quite simply, there’s no other building like it in the world and if we had to describe it in less than ten words we’d say, “a sixteenth-century cathedral inside an eighth-century mosque.” But that doesn’t even begin to convey the ten-plus wow factor of this UNESCO World Heritage Site, without a doubt the most stunning religious place we’ve ever seen. Nor does it suggest the promising symbolism of two major religions, Islam and Christianity, coexisting in one shared space. 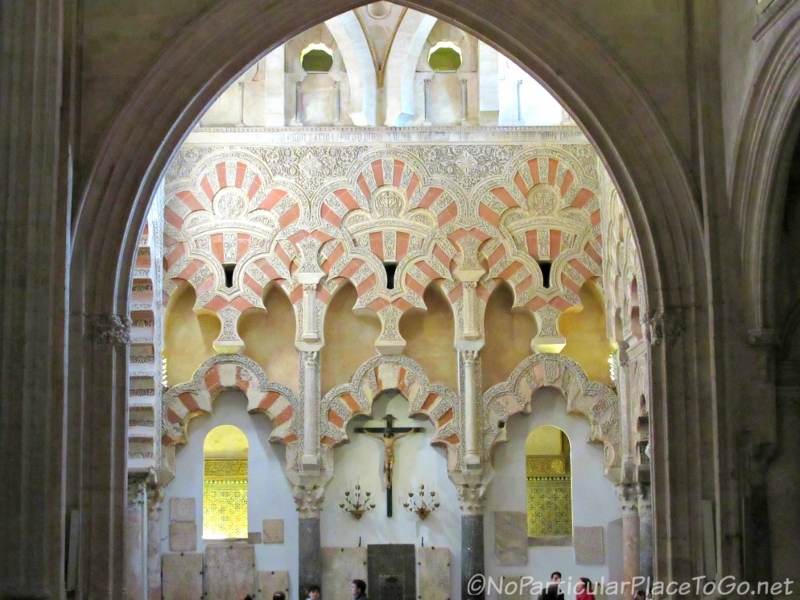 Córdoba’s history stretches back for more than two thousand years to its founding in the second-century, BCE and the land upon which the Mosque-Cathedral was built has long been sacred to many religions. Originally there was a Roman temple dedicated to Janus, the two-faced god looking at both past and future. 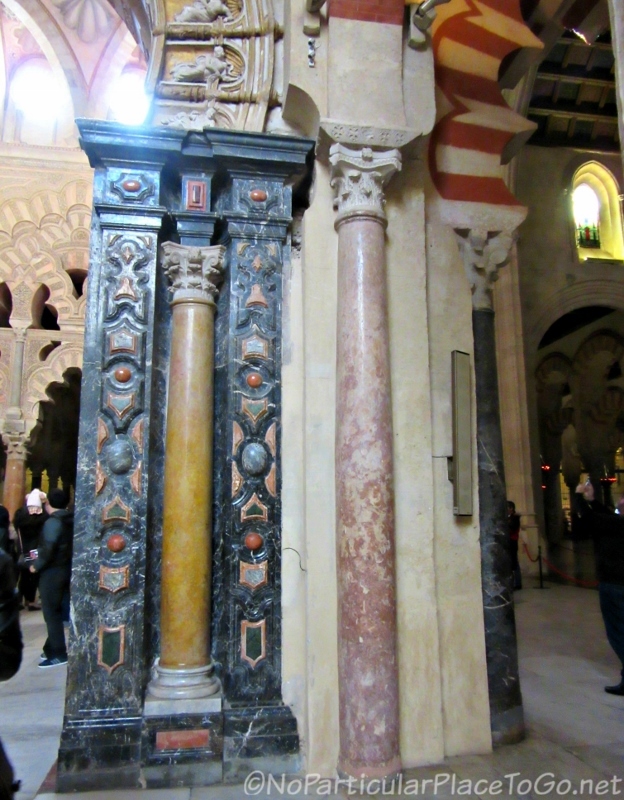 When the Visigoths invaded Córdoba in the sixth century, they converted the temple to a cathedral dedicated to the gruesomely tortured martyr, St. Vincent of Saragossa. 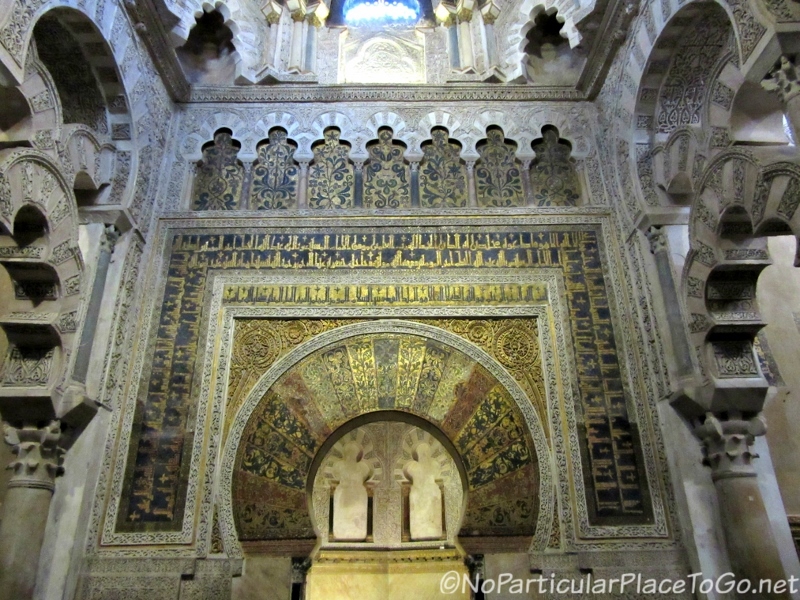 Next came the Moor’s invasion at the beginning of the eighth-century and, for a time, the worship space was divided between Muslims and Christians before the cathedral was demolished to build the Great Mosque of Córdoba at the end of the century. 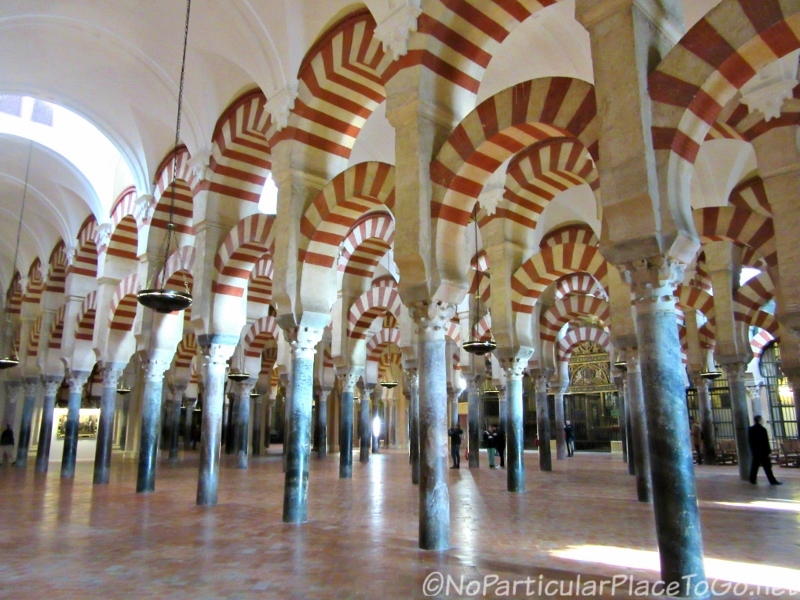 The construction of the Great Mosque of Córdoba began in 784 CE and lasted for over two centuries resulting in what UNESCO refers to as “the most emblematic monument of Islamic religious architecture.” Thousands of artisans and laborers were employed. Only the finest materials were used: stone and marble quarried from the mountains of nearby Sierra Morena and columns of granite, jasper, marble and onyx recycled from the original temple and other Roman ruins around the Iberian peninsula. Upon the columns were the double arches which allowed for support of the higher vaulted ceiling. The lower horseshoe-shaped arches were made of red brick alternating with white stone that continually draws your eye. 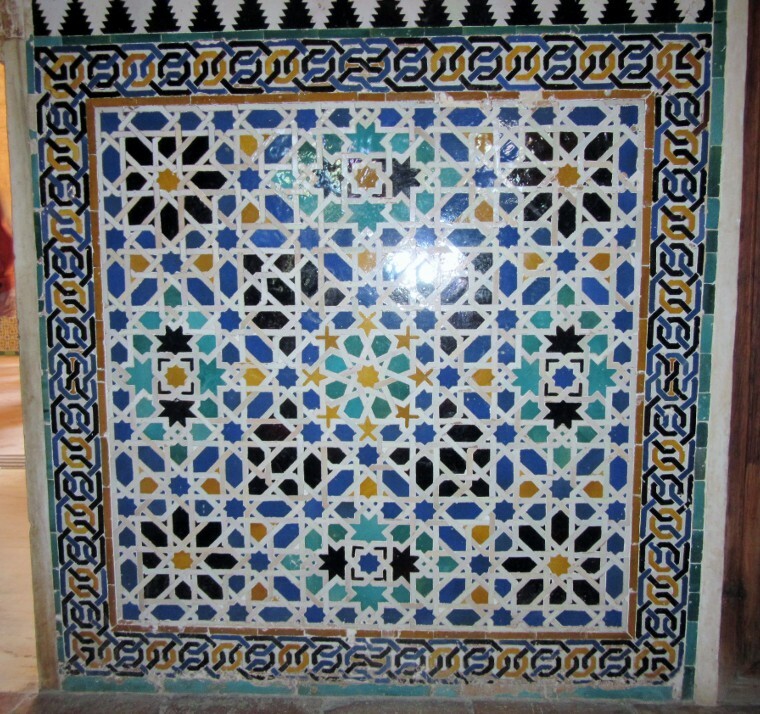 The décor was fashioned from ivory, gold, silver, copper, brass and mahogany and intricate mosaics from azulejos (glazed, colored tiles) were designed. Interestingly, the mihrab or prayer niche, a piece of ornate artwork in dazzling colors that stands out among all the other splendidness, faces south rather than the traditional placement towards Mecca. 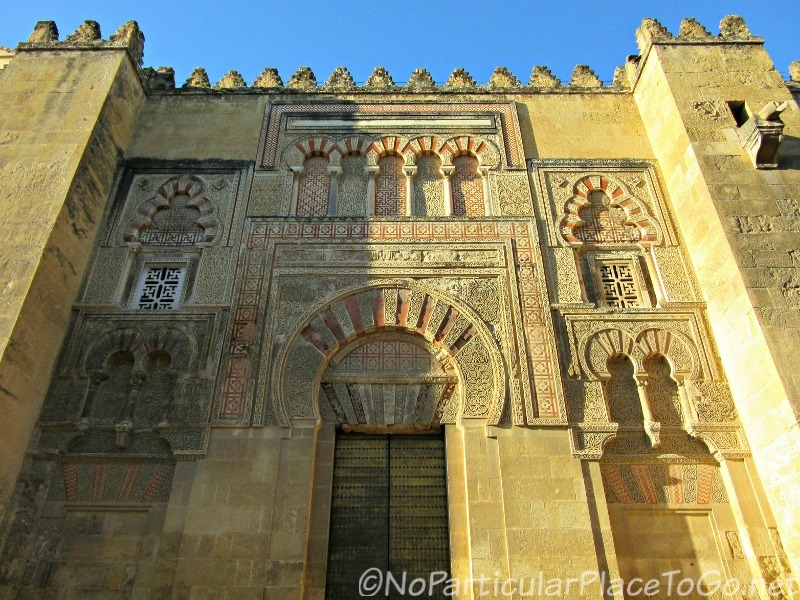 A remarkable and unique creation, the Great Mosque of Córdoba held a central place of importance among the Islamic community and was a major Muslim pilgrimage site. 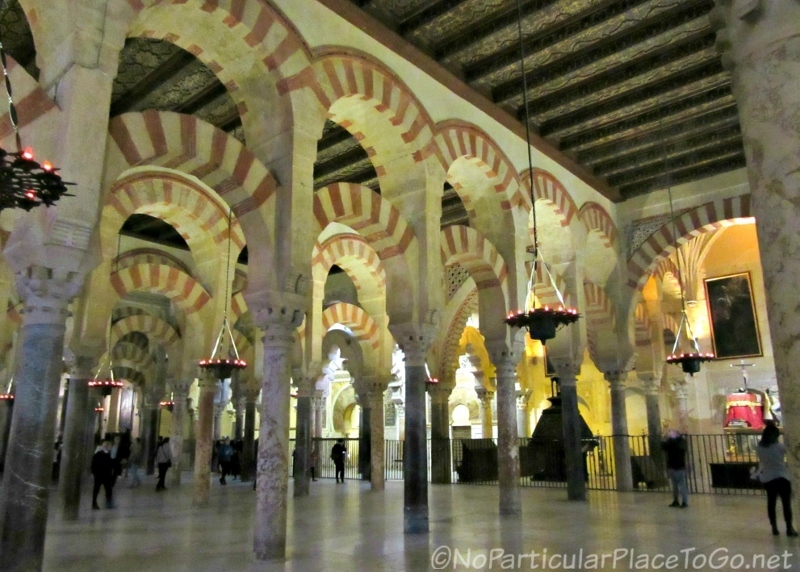 Following the Christian invasion of Córdoba in 1236, the mosque was preserved as a very visible trophy of Castillian Spain’s victory over a former Islamic land. 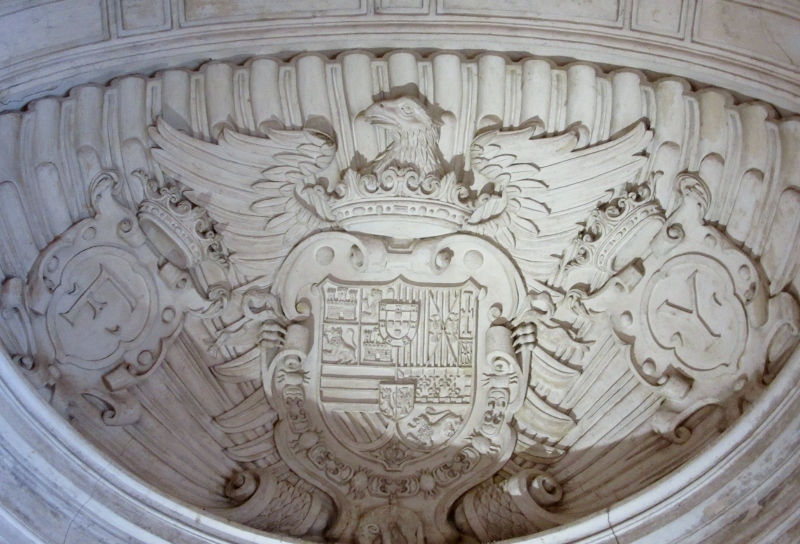 Besides the symbolism, the Reconquista and kingdom building was a spendy proposition and Spain, not wanting to divert its money from conquest to building places of worship, spent some of its energies converting mosques into churches. 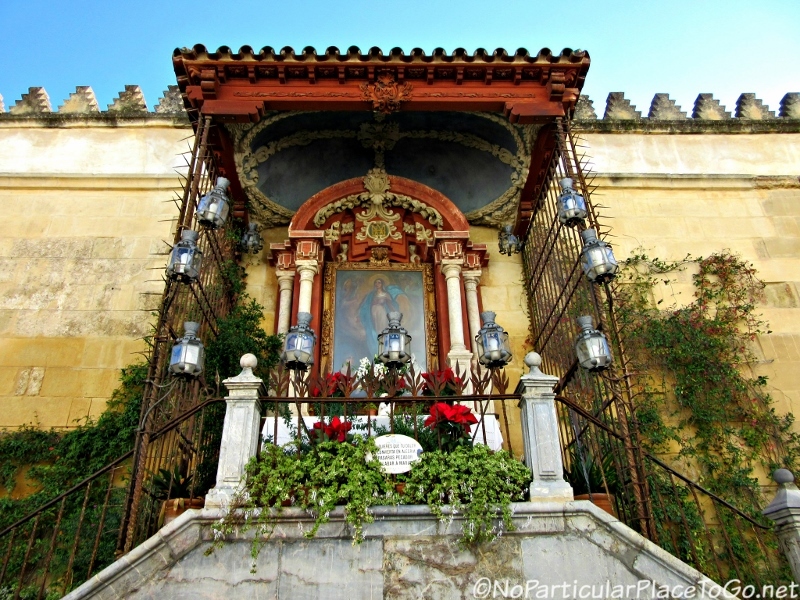 The former Great Mosque of Córdoba was renamed the Church of the Virgin of the Assumption, dedicated to the Virgin Mary and consecrated with the sprinkling of holy water which allowed the transformation of religion from Islam to Christianity. Over the years a couple of chapels were constructed to the side of the vast space and the four-story minaret, from which calls to prayer were previously heard, became a tower for tolling bells summoning faithful. 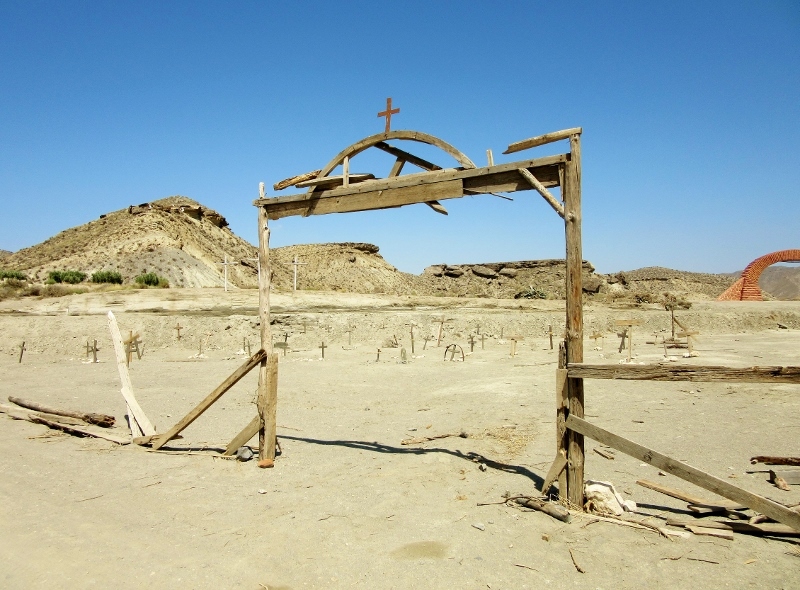 For nearly three centuries, no major alterations were made because the church was a little occupied with imposing the one, true religion upon the land. In between converting Muslims and Jews to the correct religion or expelling the lucky ones altogether from the realm, they occupied themselves with the horror called the Spanish Inquisition. 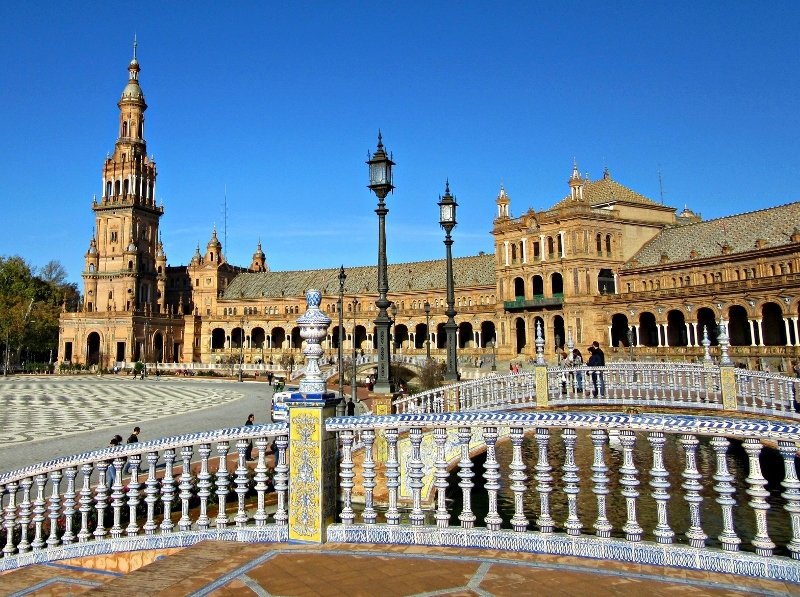 It wasn’t until the sixteenth century that the reigning monarch, King Charles V (also confusingly known as King Carlos I) turned his attention to the former mosque in response to a proposal by the church to build a cathedral within the center. 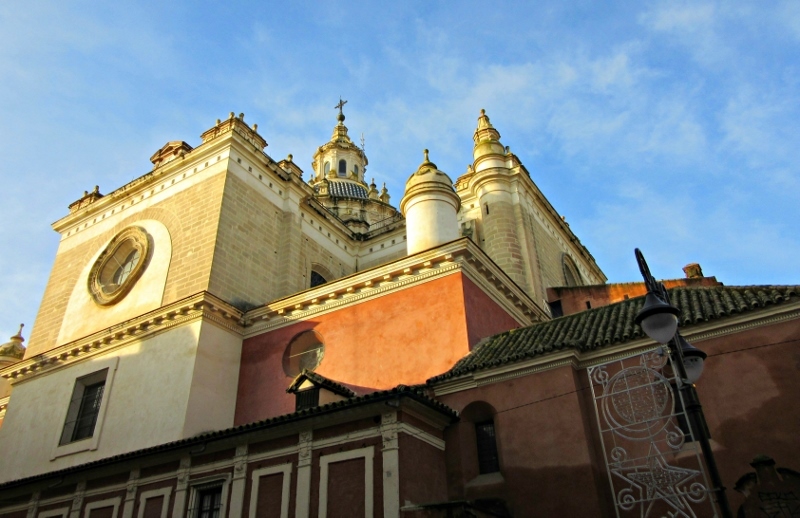 Overruling the objections of the people, the King, completely ignorant of the building’s unique beauty because he’d never visited Cordoba, backed the church’s request. 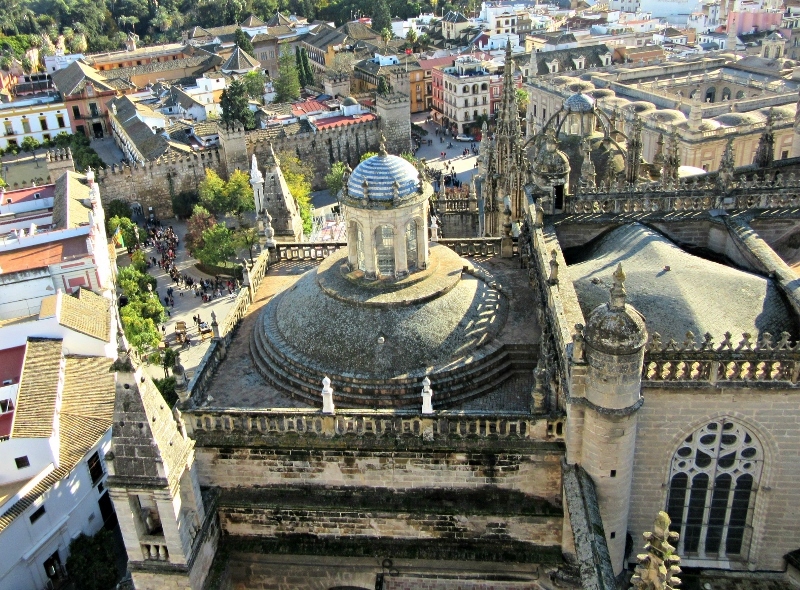 The heart of the Great Mosque of Córdoba was demolished and over the next couple of hundred years (1523–1766) the cathedral was built in a variety of styles ranging from late Renaissance, Gothic, and Spanish Baroque. 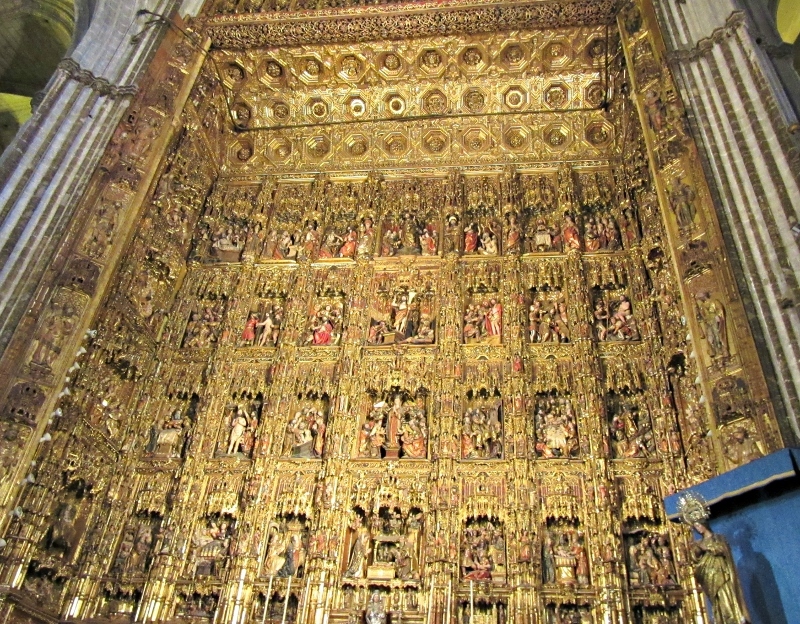 Like many cathedrals, it’s breathtaking with its ornately carved mahogany altar and the plunder from the New World gilding surfaces in silver and gold. A variety of semi-precious stones are used throughout the area and oil paintings of notable events and personages are abundant. 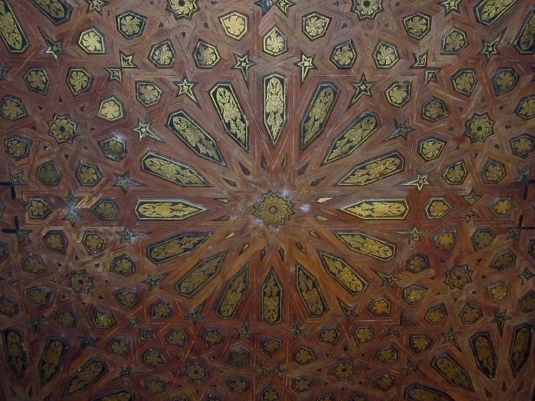 It is however, bizarrely at odds with the original architecture of what was once Islam’s crown jewel. 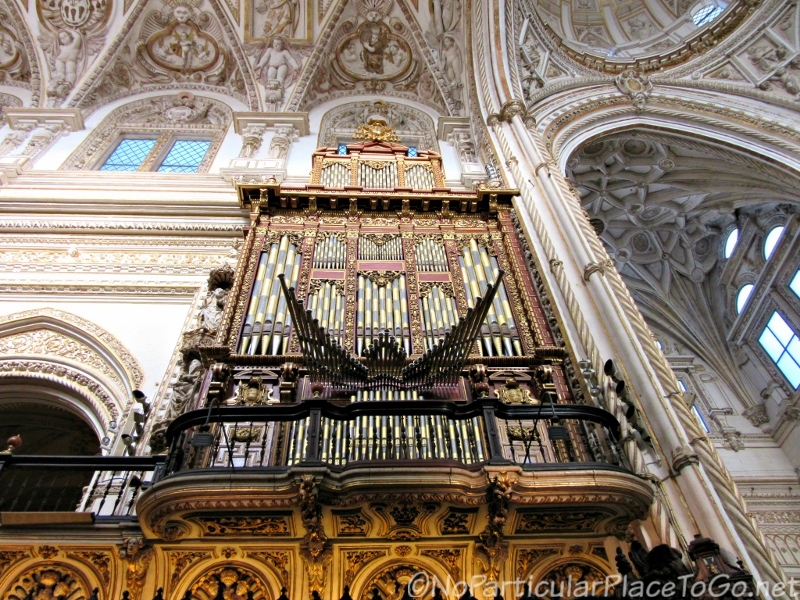 There is one more strange and short chapter in the story of the Mosque-Cathedral of Córdoba. 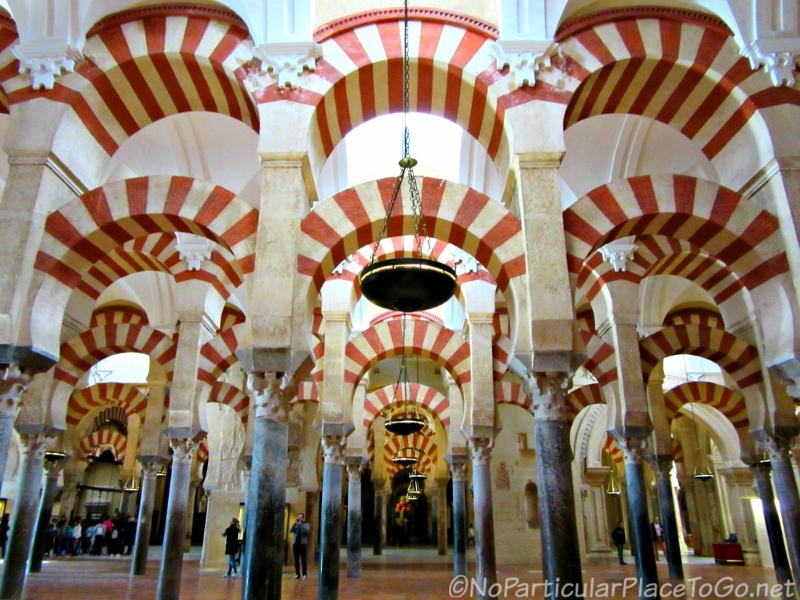 In 2006, the diocese of Córdoba dropped the Mezquita (Mosque) part of the building’s name and began to simply call it the “Catedral de Córdoba” in what was seen by many as an attempt to hide its Islamic origins. In 2013, an online petition garnered hundreds of thousands of signatures protesting the omission. 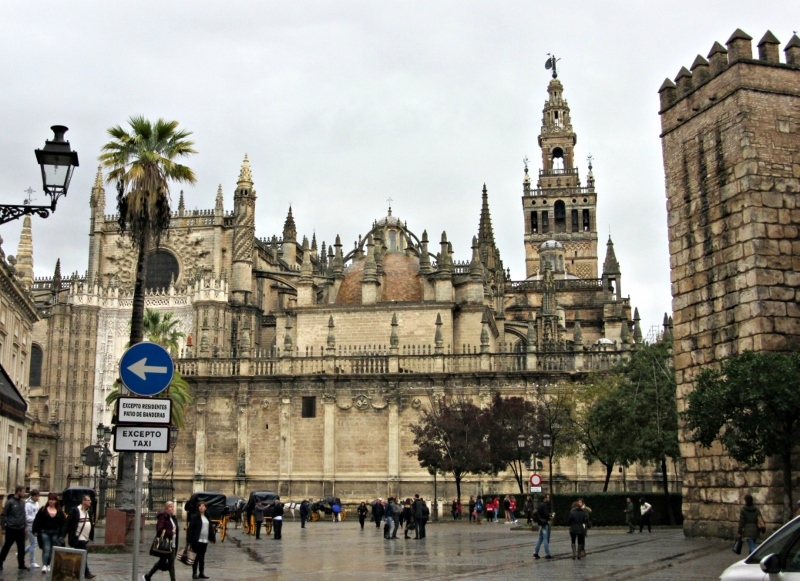 Finally, in April of 2016, a resolution of the dispute between the local authorities, the regional government of Andalusia and the Catholic Church was reached and the building is now referred to as the Mosque-Cathedral Monument Complex or Conjunto Monumental Mezquita-Catedral. 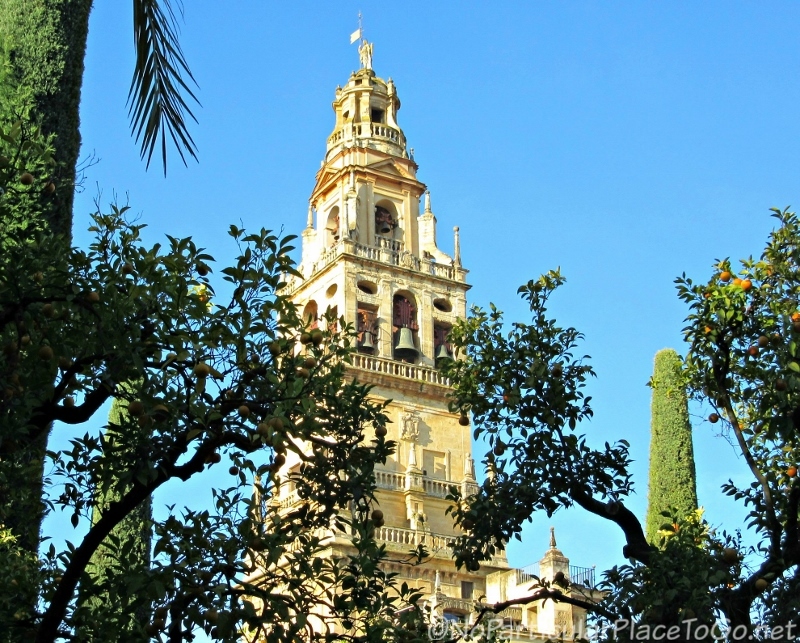 We took the “slow” train from Seville to Córdoba for under €14 and a less than ninety-minute journey through flat, mostly rural countryside, lushly green from the recent rains. 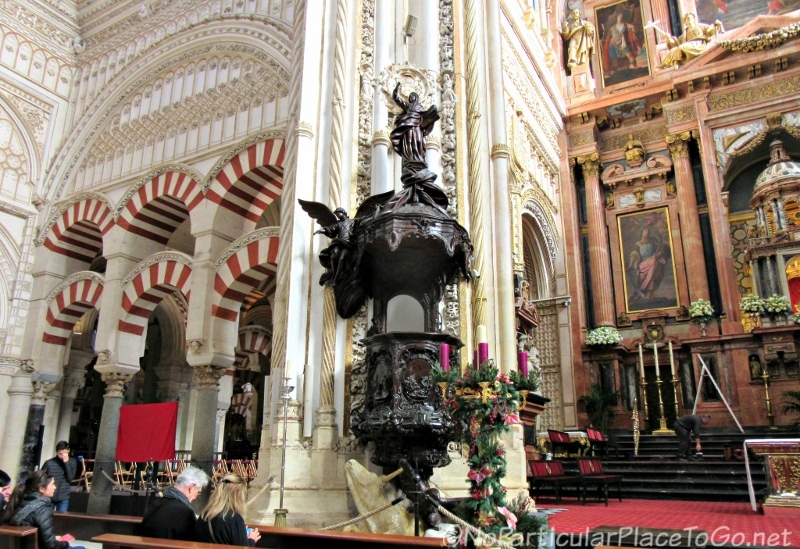 We’re not sure why Córdoba hadn’t popped up on our radar well before our last trip to Spain but once we started reading about the city and its history, it rapidly rose to the top of our places-to-go list. Not to say that we don’t usually do a little preparation before traveling to a new place but this time we were unusually prepared with a two-page list of things to see, including a place we’d run across only in passing; described as a “hidden treasure.” Located next to the Alcázar of Córdoba, we could see the Royal Stables (aka the Caballerizas Reales de Córdoba ) from vantage points atop the Alcázar’s walkways along the old walls as well as a lone horse and rider practicing a series of moves in a small arena. 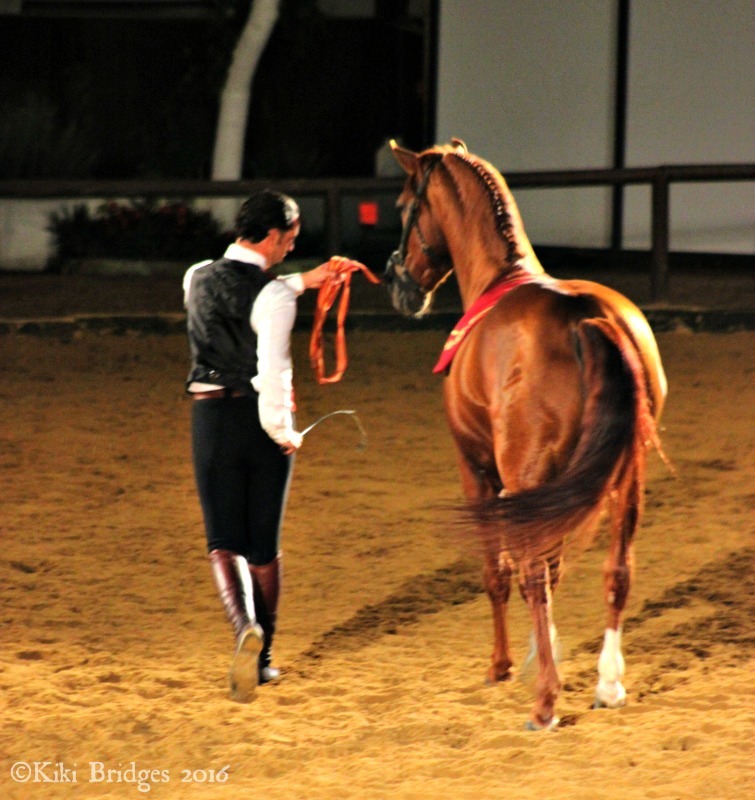 The Caballerizas Reales date from 1570 when King Felipe II, described in many accounts as “a great lover of horses,” commissioned Diego López de Haro y Sotomayor to build the royal stables where he hoped to breed thoroughbred Spanish horses. 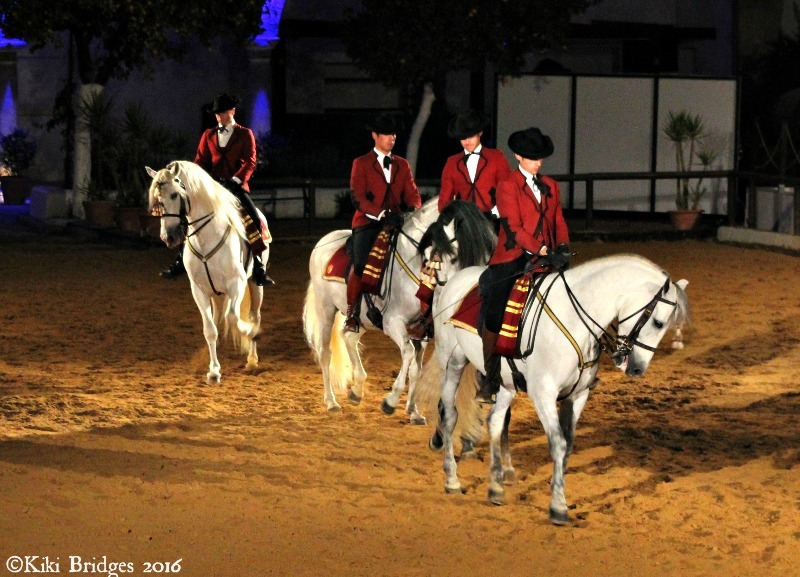 Not that we’ve visited many stables but we can safely say that these will be among the grandest we’ll ever see and why these stables deserve a place as one of Córdoba’s historic monuments. 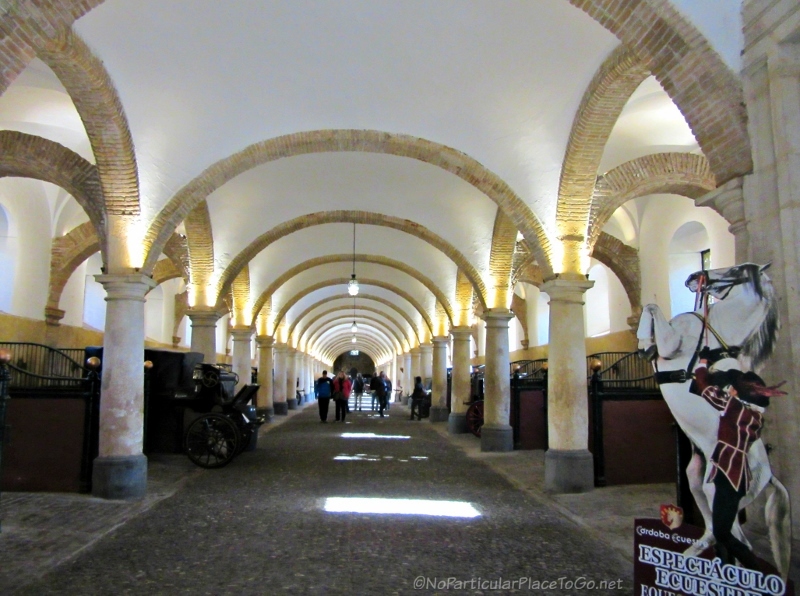 The stable area is massive, almost cathedral-like in atmosphere, with a long center hallway and horse stalls on either side. Sandstone columns support a cross-vaulted ceiling and numerous, small windows light the space in addition to suspended lanterns. 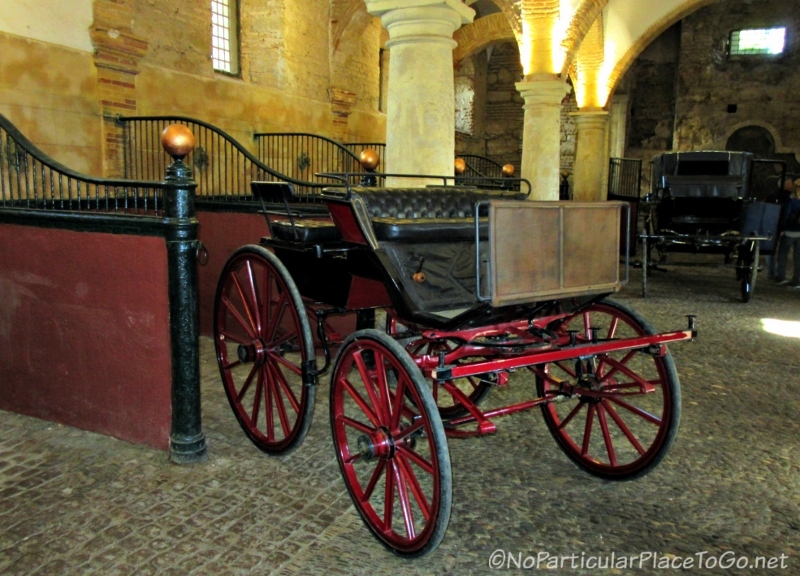 A new stable houses the royal horses while the old stable contains many elegant coaches and conveyances once used by the royals and other elites. 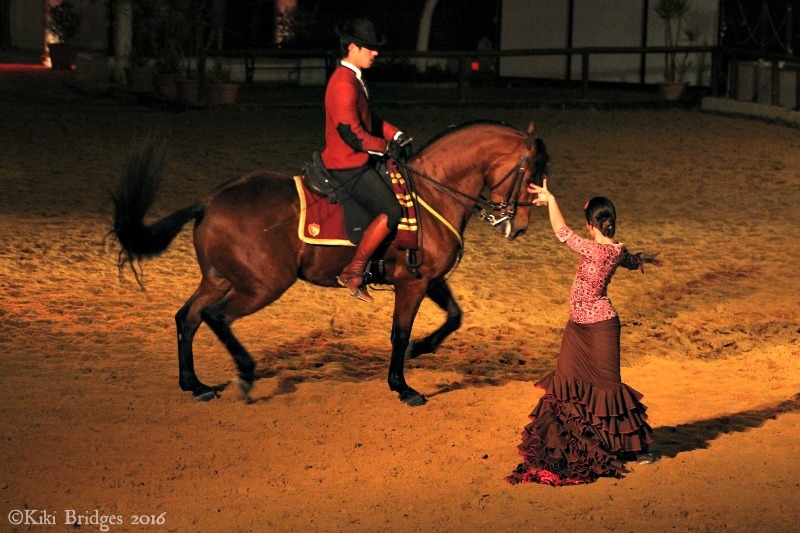 And here in the royal stables, according to a decree by King Felipe II which laid out formalized standards, the pure Spanish thoroughbred, known as the Andalusian horse, was officially documented as a breed. 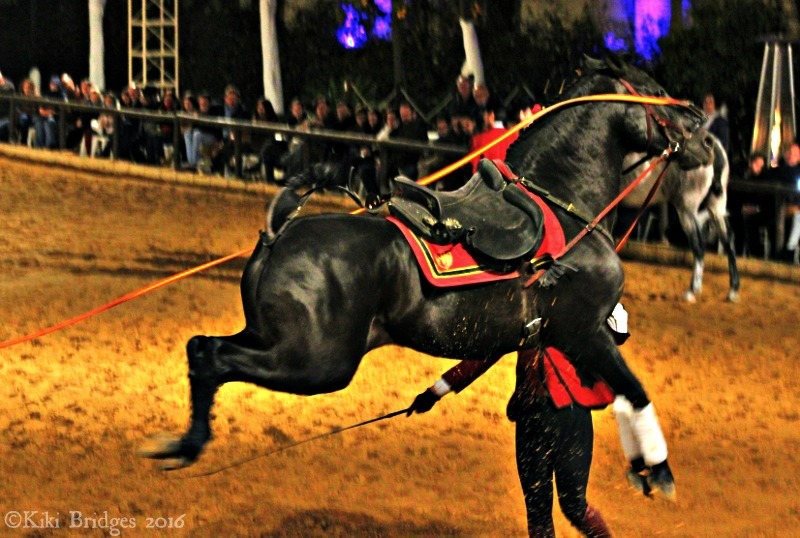 From the very beginning, the horse was incredibly popular among European royalty and became a symbol of the Spanish empire. 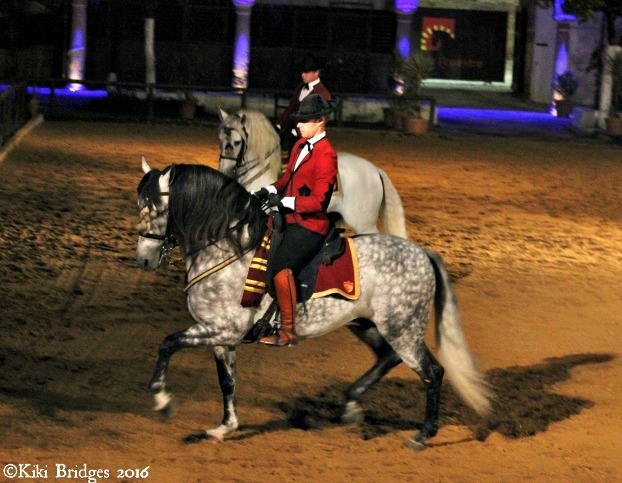 The horse carried the conquistadores to the New World and its reputation as a prized war horses almost led to the demise of the breed in the Iberian Peninsula when Napoleon invaded Spain in the 1800’s and seized them for his own invasion. Luckily a small herd was sequestered at a monastery in Cartuja near Granada and the breed recovered. 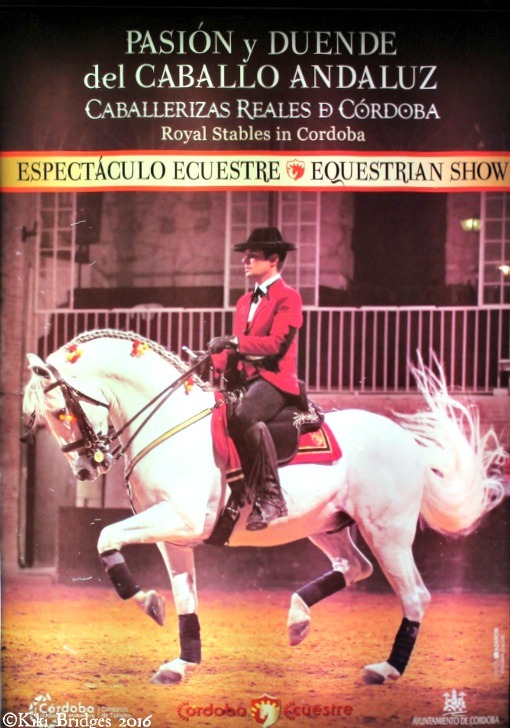 Today the Andalusian horses number over 185,000. 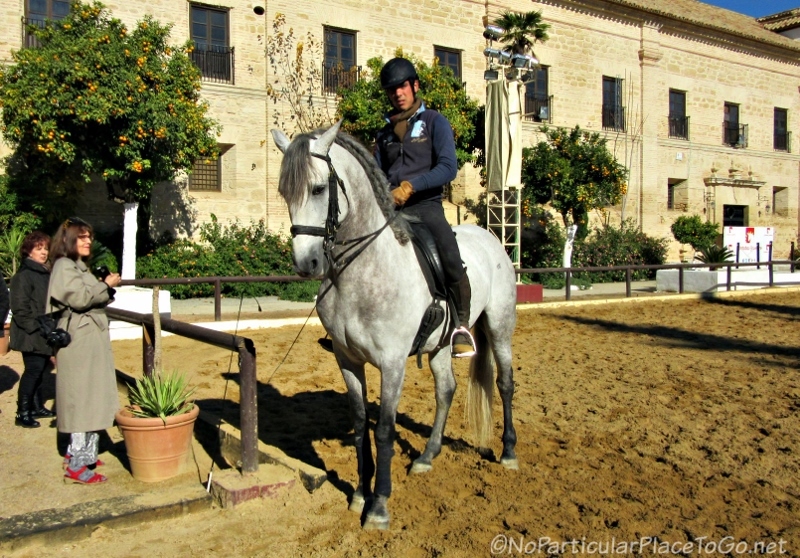 Quite by serendipity and even before we visited the stables, the Hostal La Fuente where we stayed told us about the equestrian show, “The Passion and Spirit of the Andalusian Horse.” Purchasing the tickets (a great value at €15 for an hour’s performance) also allowed us to visit the arena during a rehearsal. The program was a terrific chance to see these magnificent creatures display their intelligence and beauty. Far from knowledgeable about horses in general, we didn’t have to be die-hard horse lovers to be completely captivated by the graceful and magical performance. 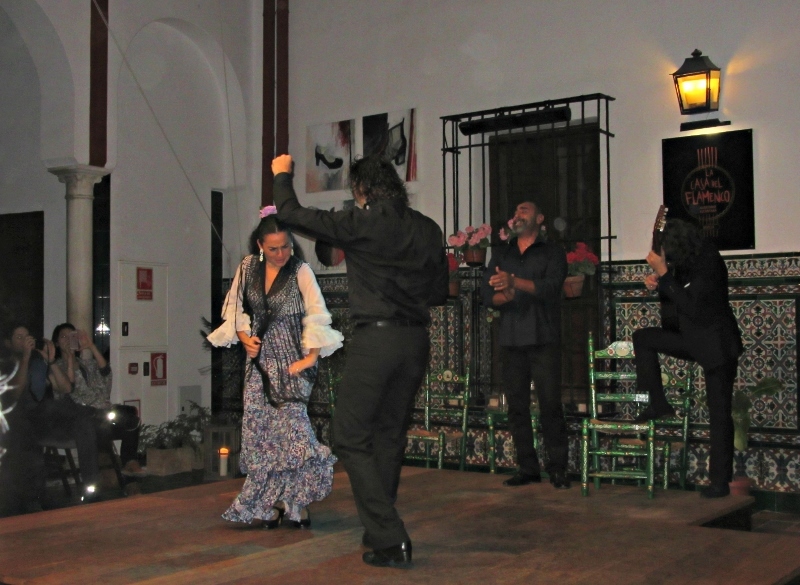 For those who wanted to get more show for their money, there were several dances featuring a flamenco dancer and some wonderful Spanish guitar in the background which added to the ambience. 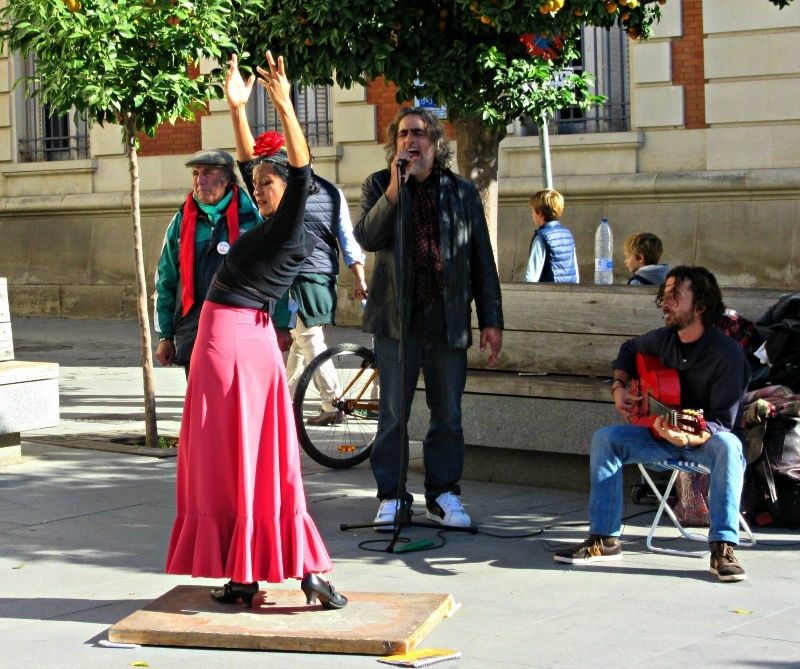 For us, the flamenco dancer was extraneous and rather a distraction from the real stars of the show. 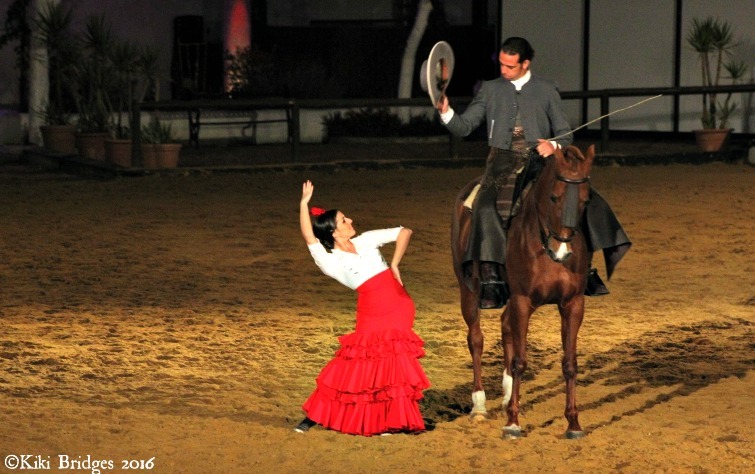 We were captivated with the intricate footwork, stylized gaits and beauty of the whole performance. 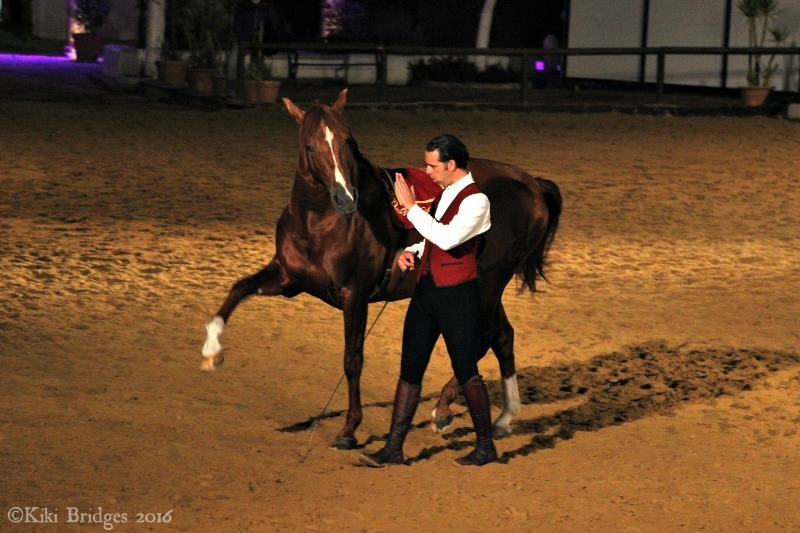 At times, it was almost as though as invisible string could be seen between the rider and horse as they seemed to communicate intuitively. 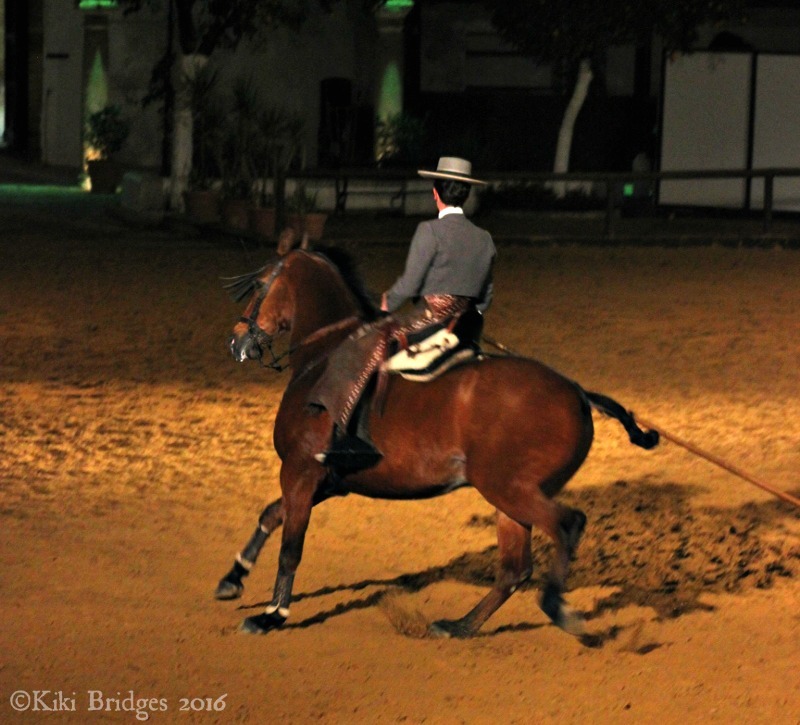 Obviously, the training involves hundreds of hours with a very skilled trainer and/or rider and an incredibly intelligent horse. Information: The show is every Wednesday, Friday and Saturdays at 20:00 and Sundays beginning at 12:00. 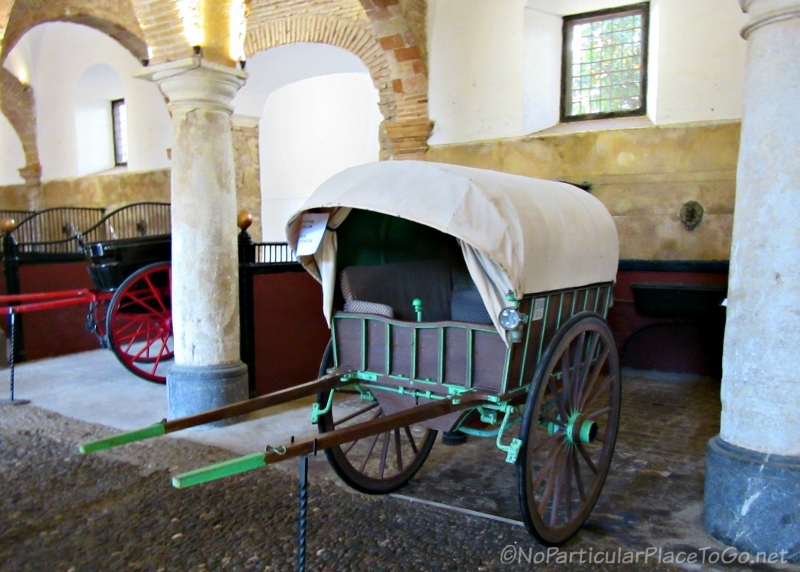 Entrance to The Caballerizas Reales is free for visiting, from Tuesday to Saturday during the morning hours from 11:00 to 13:30 and afternoon hours from 16:00 to 20:00. Special thanks to our friend, Kiki Bridges, who generously shared her photos for our post. 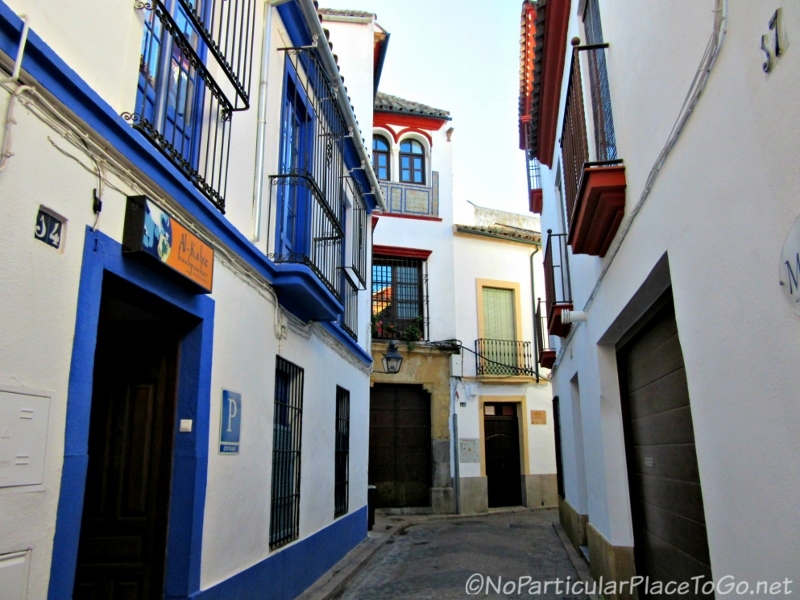 We left early in the morning to make the seven-plus hour drive from Lagos, Portugal, to Mojacar, a resort city where friends were staying in Spain’s Costa del Sol region. The toll road (the A-22) that took us along the southern coast of Portugal was smooth and sparsely populated and, after several months of driving along this stretch of road, we felt sufficiently confident to listen to an audio book while the miles passed. As usual, we traded the time behind the wheel back and forth and, with a cooler for drinks and some snacks, we only needed to make a few, short breaks. About five hours into the drive we passed north of Granada and were thrilled to see the Alhambra atop the hill in the distance which we had visited a few months earlier and wrote about here. The highway began to climb and wind through the Sierra Nevada Mountains and we spied snow on many of the higher peaks although it was almost summer. Oleander, with pink and white flowers, and bushes with brilliant yellow blossoms filled the median of the highway with vibrant color for miles. Evidently this was a major freight route because we passed uncountable numbers of long haul tractor-trailers (we’re not sure who drawled, “We’ve got us a convoy” from the old song which cracked us up) laboring their way up the slopes and braking on the downside. Presently, we left the highway for a two-lane road; the land became more arid and the small olive groves and vineyards that we could see from the road thinned out. 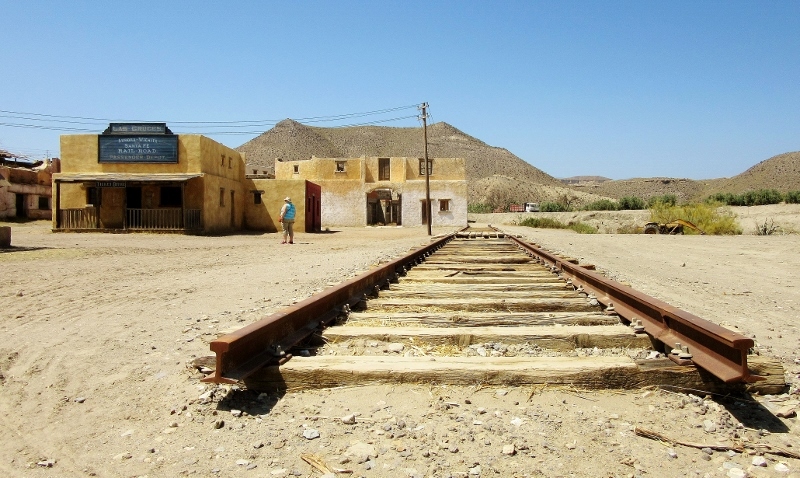 We passed through little villages and wondered out loud why people had chosen to live in such an inhospitable country. And then, like tech-dependent travelers everywhere, we checked our GPS and finally (a throw-back to our generation) we pulled out our road map of Spain as well to check our whereabouts. 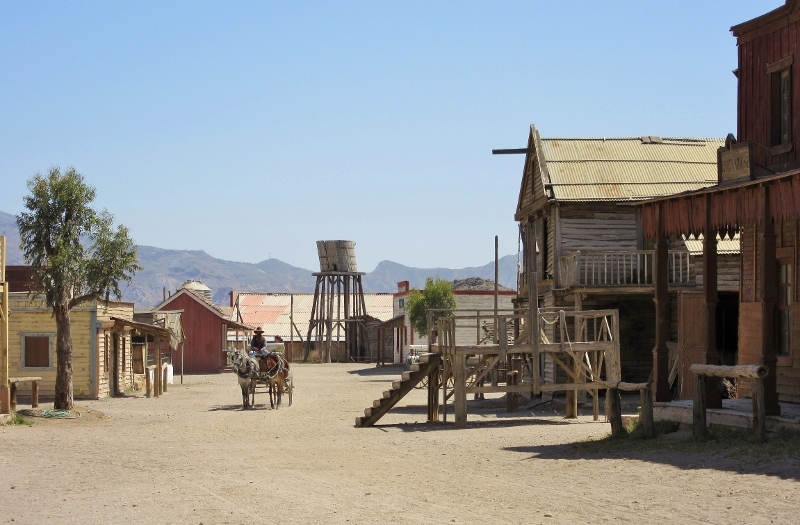 Here’s the landscape made famous by many of the old “Spaghetti Westerns,” a term widely used to describe the international films, most of which were directed by Italians and included multilingual crews and casts from Spain, Italy, France, Germany and the US. 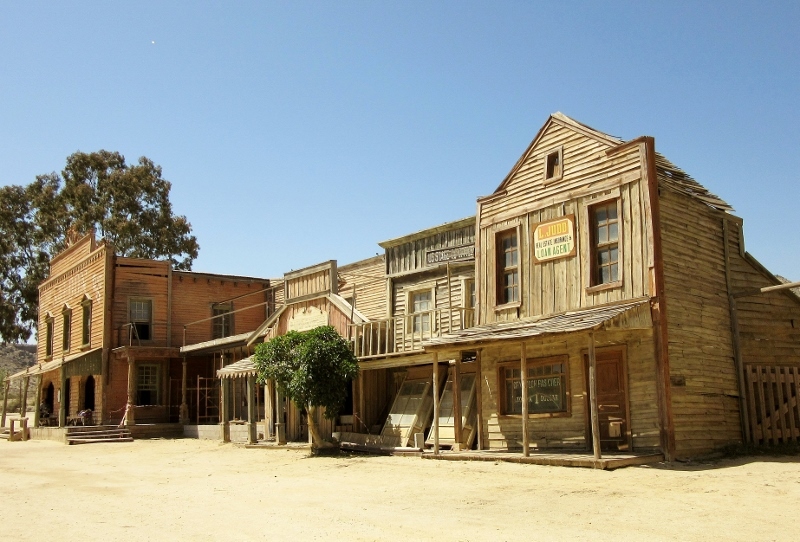 In fact, between 1960 and 1980, over 600 European Westerns were made. 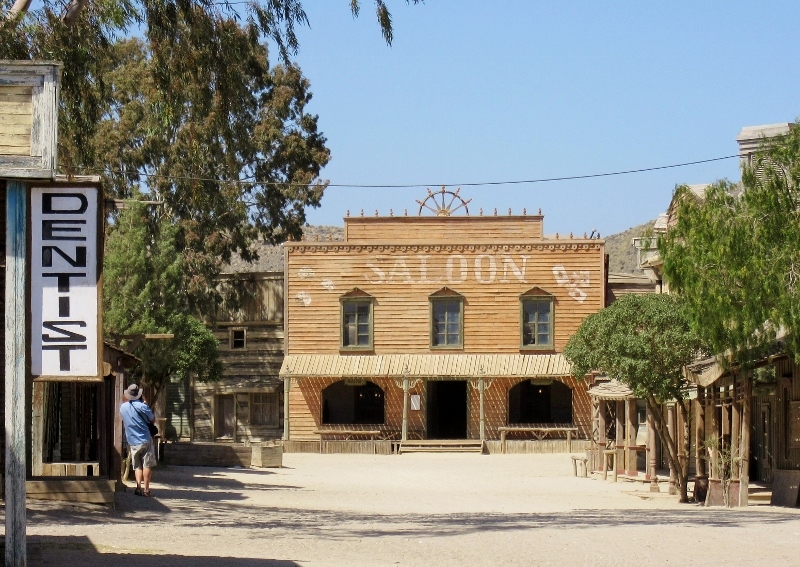 Sergio Leone, an Italian who shot many of his movies in the Tabernas area, was the genre’s best known director and his wildly popular film-making style in the sixties made his movies international box office hits. 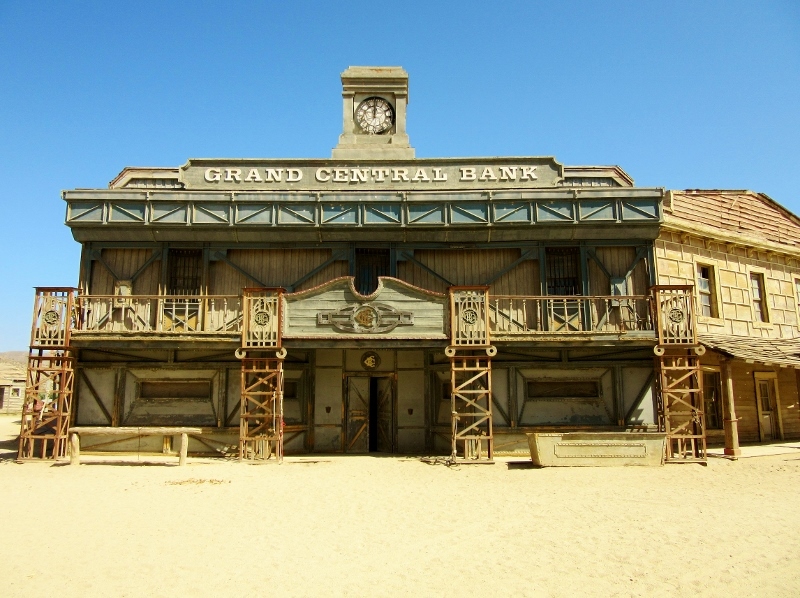 We’d seen the three movies known as the “Man with No Name” or “Dollars Trilogy” with the up and coming star, Clint Eastwood, which included one of our all-time favorites, “The Good, the Bad and the Ugly.” No wonder we had a feeling of déjà vu! 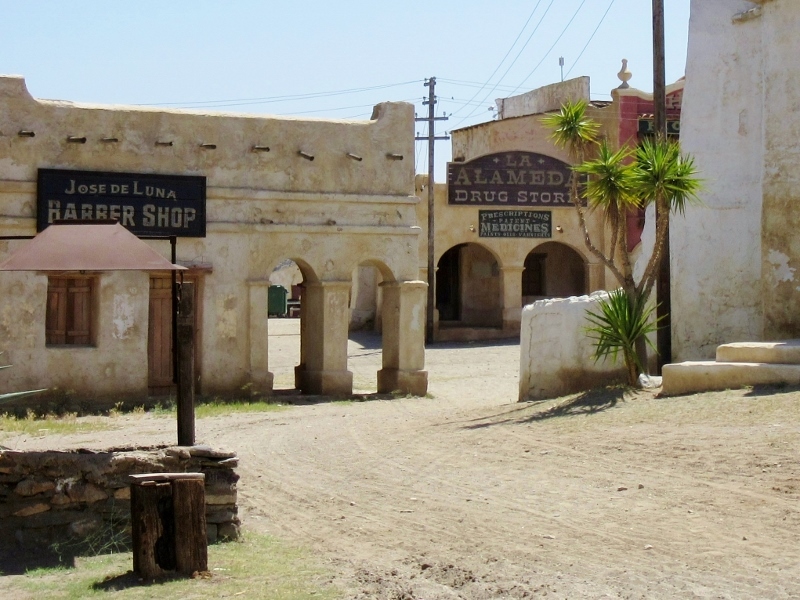 The sets built for many of the old spaghetti westerns were acquired by a stuntman-turned-entrepreneur, Rafa Molina, in 1977 and have been turned into a nostalgic western-style theme park called “Fort Bravo, Texas Hollywood.” At the entrance gate we handed over the not-so-insubstantial fee of 35€ which included a senior discount. 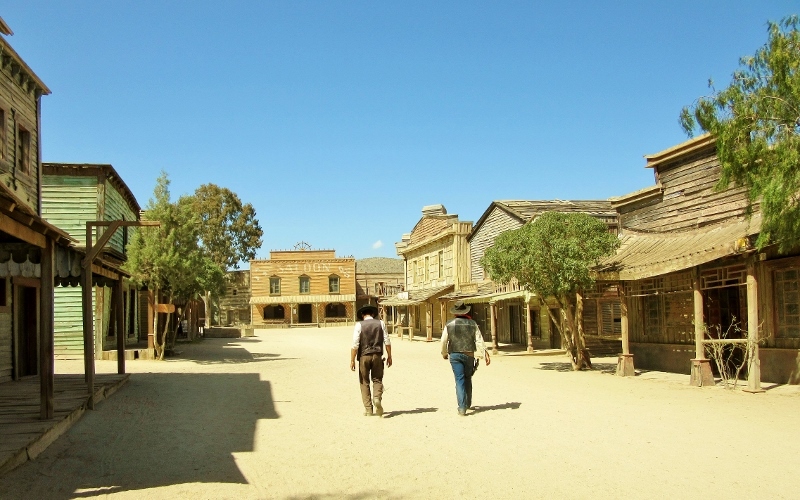 A few steps took us back in time – a hundred years and more – and place – the American wild west – as we strolled through dusty streets exploring movie sets, ready and waiting for their next role as backdrops in an old west or southwestern epic. We’d been in Lagos for three months and were itching for a road trip to an epic destination, a way to celebrate receiving our one year Portuguese residency visa. 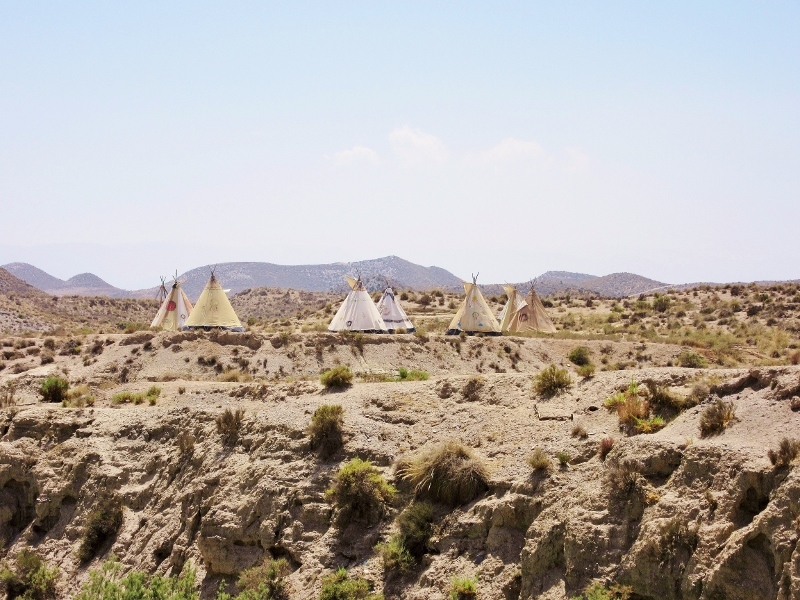 There was no question about where to go since we’d long dreamed of seeing this UNESCO World Heritage Site, a place of mystery, myths and history. 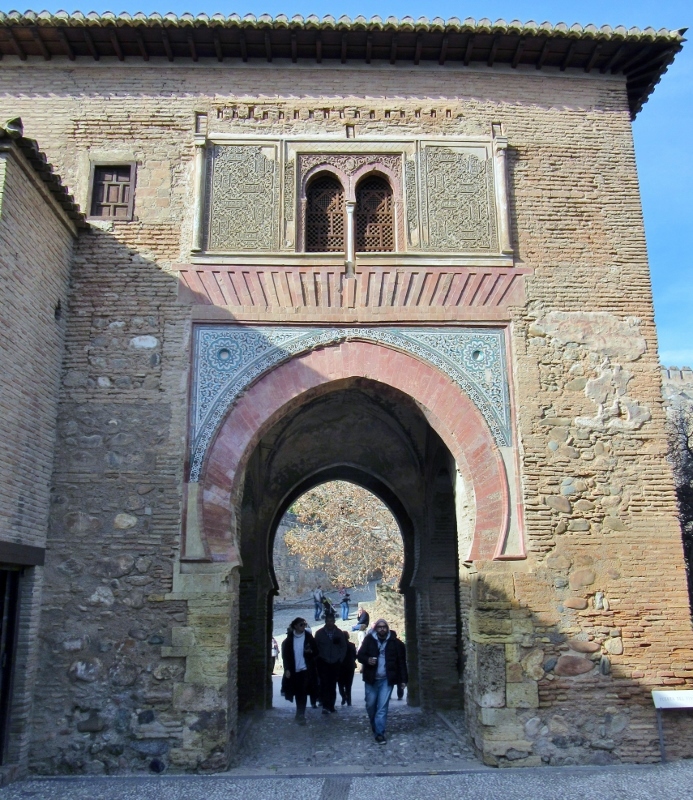 A look at google maps showed us that the Alhambra, the palace of Sultans and Spanish kings was a mere six-hour drive – no magic carpet required. The Moors invaded the Iberian Peninsula in 711 and the first references to a fortress perched high upon the hill, Al Sabika, dates back to 889. 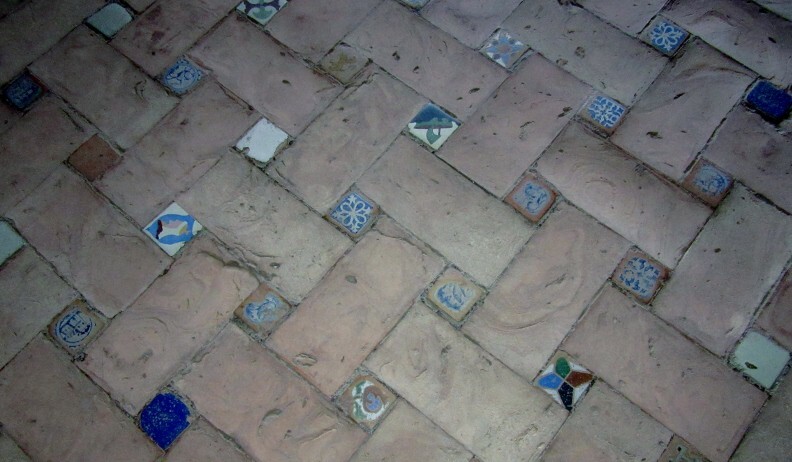 It was all but forgotten until the mid-13th century when the ruins were renovated and rebuilt and the royal residence of the first Sultan of the Nasrid dynasty was established. 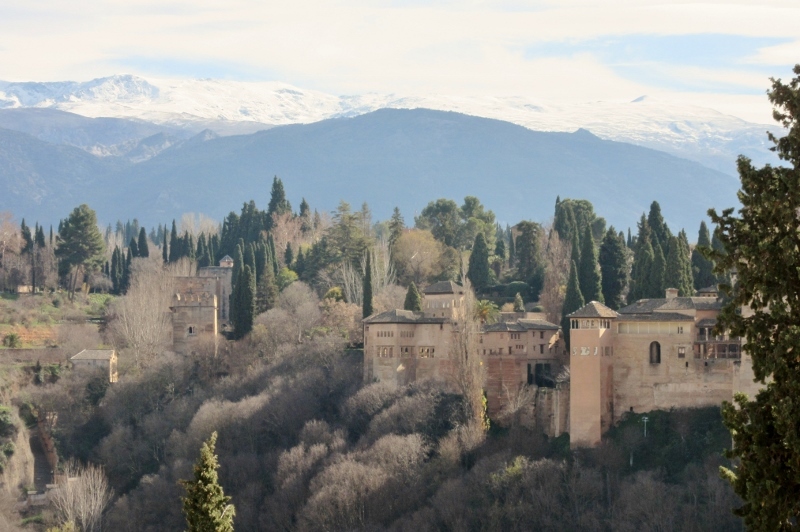 Protected by mountains at its back (the Sierra Nevadas) and thick woods surrounding it, the Alhambra was a reflection of the glory days of the house of the Islamic Nasrids, the last of the Muslim Emirates of Granada. There were twenty-two Sultans who resided in the palace city of the “Red Castle” with their wives, harems and courtiers. Of these, twelve were assassinated so, while the life of a Sultan was luxurious, it was not secure. Intrigue and in-fighting between Moorish tribes, royal courts, cities and generals was always present. And, with the conquest of Granada by the Catholic Monarchs in 1492, the Moors finally retreated. The flag of Ferdinand and Isabella (yes, that Ferdinand and Isabella!) 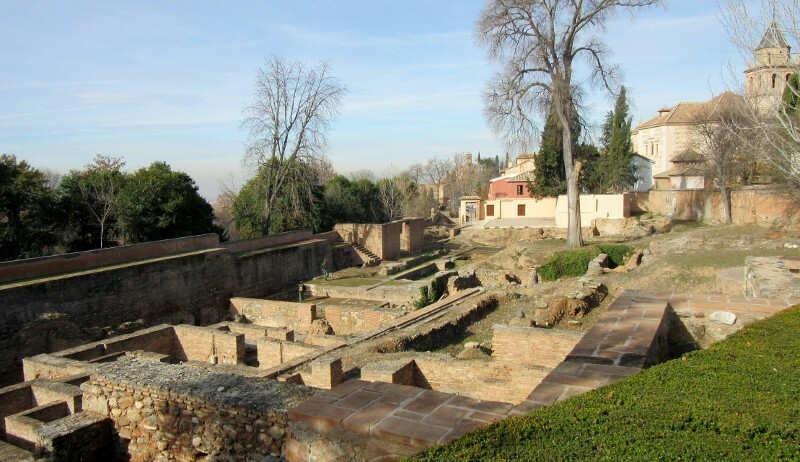 was raised over the Alhambra on January 2, 1492, and after the Reconquista the near-by town (Granada) quickly encroached upon the palace walls. We began our private tour at the upper-most portion of the palace grounds at the northern end of the complex, the only section that was built outside the protection of the massive walls. The Generalife was the daytime residence and formal gardens of the royal family and it was here that the massive scale of the Alhambra became truly obvious. From this height the individual buildings, actually palaces in their own right, spread below on the lower hillocks. It was a cold, January day and the numbers of tourists were nowhere close to the 8,000 maximum allowed per day during the high season. The snows on the upper slopes of the Sierra Nevada mountains to the east, were muted against the leaden sky but when the sun emerged later in the day the contrast of white versus the blue sky was dazzling. The day of our tour only a fraction of the flowers were in bloom but the towering cypress that lined the walk and the precisely trimmed hedges in geometric patterns alongside the curves of orange and pomegranate trees were beauty enough for us. It was easy to imagine the drone of bees amongst the profusion of flowers with butterflies flitting about seeking nectar as well as the lilting tremolos of birds that would be ushered in with the advent of spring. Yet, with the return of spring’s warmth would come the hordes of tourists. 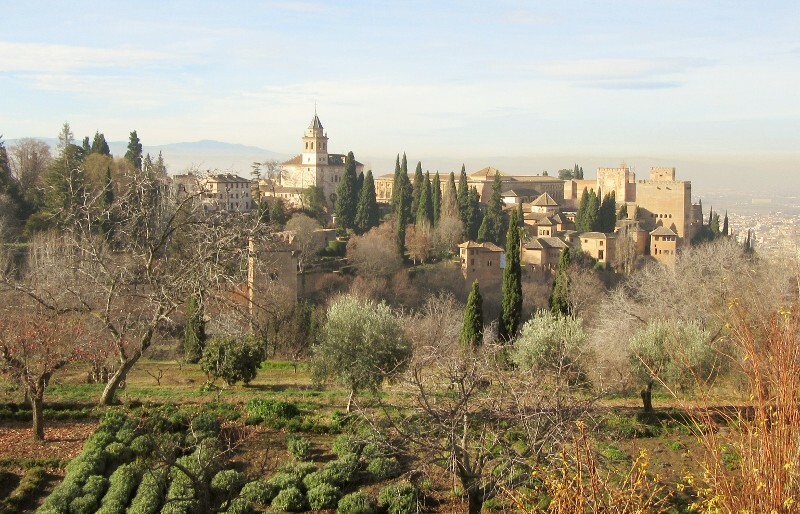 Leaving the leafy greenery of the Generalife we headed south towards the protected city of the Alhambra. Just outside the walls were a number of businesses jammed into miniscule homes. 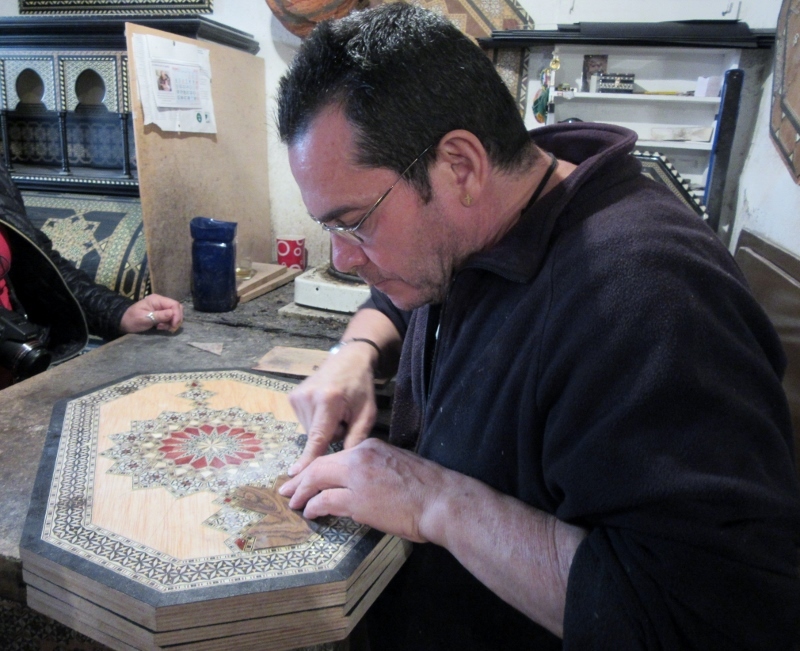 Entering Lugna Taracea, a shop run by the Lugna family in the same location for over 150 years we stopped to watch skilled craftsman assemble traditional mosaics: patterns intricately inlaid with bone, silver, copper and a variety of woods. The Lugnas specialize in lacquered furniture and household amenities such as trays, boxes and tables, all beautiful, high quality pieces including a pretty, folding cribbage board that we bought for ourselves to replace the two we’d given to our son when we started our nomadic journeys. 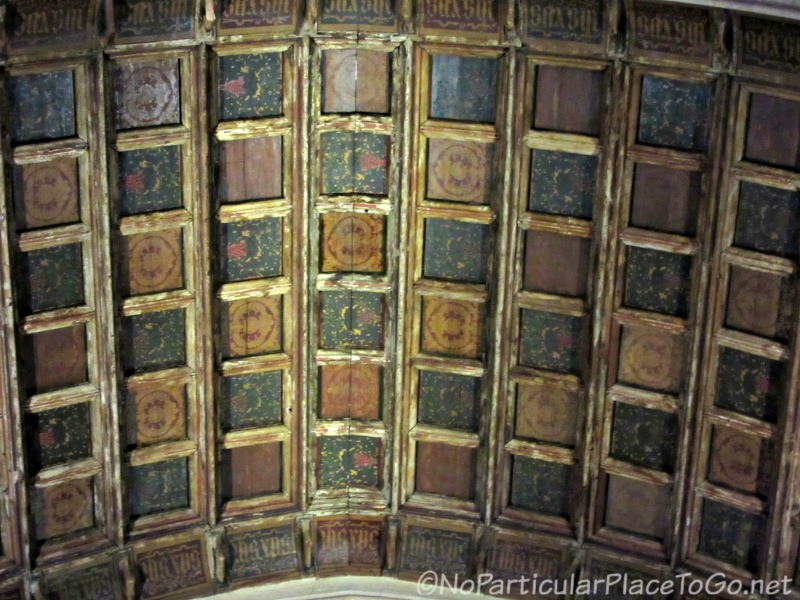 Once back inside the walls we wandered past bubbling fountains and reflecting pools, arched doorways, stone columns, tiled mosaic walls and carved ceilings of wood in detailed and complex patterns. 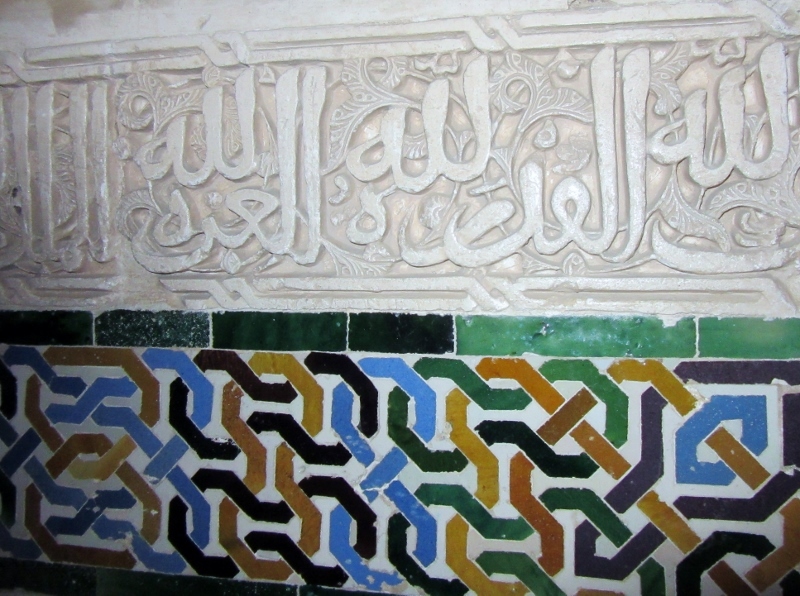 Tortuously carved stucco adorned spaces not covered by tile, marble or wood in stylized motifs and twisting Arabic words extolled the greatness and glory of Allah. Much of the stucco has faded to a creamy color although traces of color can be seen here and there. It’s almost impossible to imagine the true assault upon the senses that the original painted stucco would have triggered. 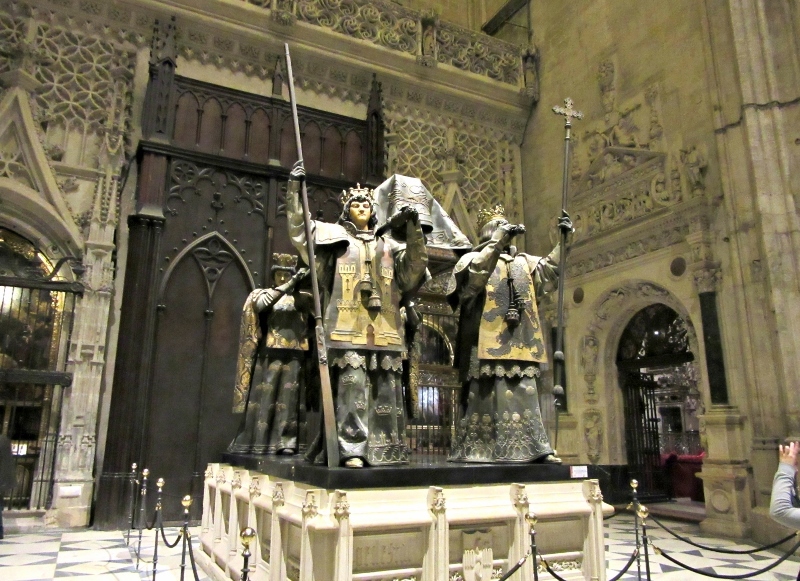 Taking up the story once again of the conquering Catholic Monarchs, Ferdinand and Isabella in 1492, we were shown the throne room where Columbus pleaded for funds to find a shorter passage to the Orient. 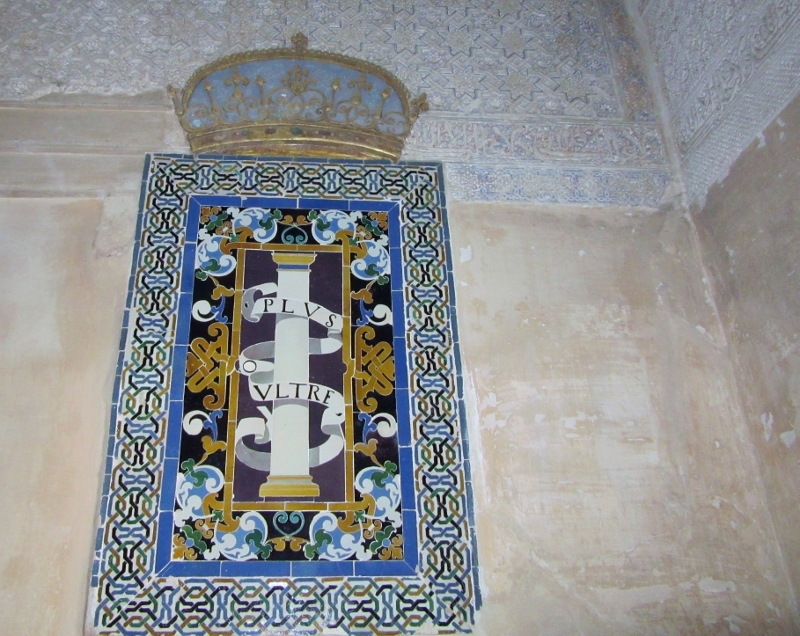 Our guide also pointed out where the initials of Ferdinand and Isabella (spelled Ysabella) were carved in stucco among the motifs and Arabic words along with the crown of the reigning monarchs. The game of empire building, which ran rampant throughout Europe at this time, continued when France, under the Emperor Napoleon Bonaparte, invaded the Iberian Peninsula and in 1812 overran the southernmost part of Spain, including the Alhambra and Granada. Decamping the Alhambra a few months later, the French, under the command of Napoleon’s brother Joseph, an inefficient and apparently venial and vindictive King of Spain, ordered sappers to mine the Alhambra. 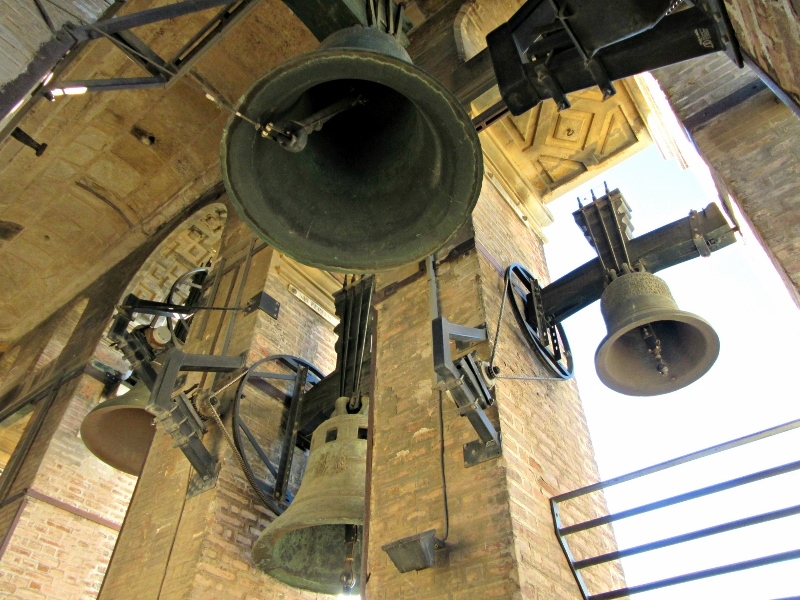 An observant and brave Spanish citizen reached the fuses and removed them from the explosives, interrupting the chain of detonations that had been intended to level these magnificent structures. 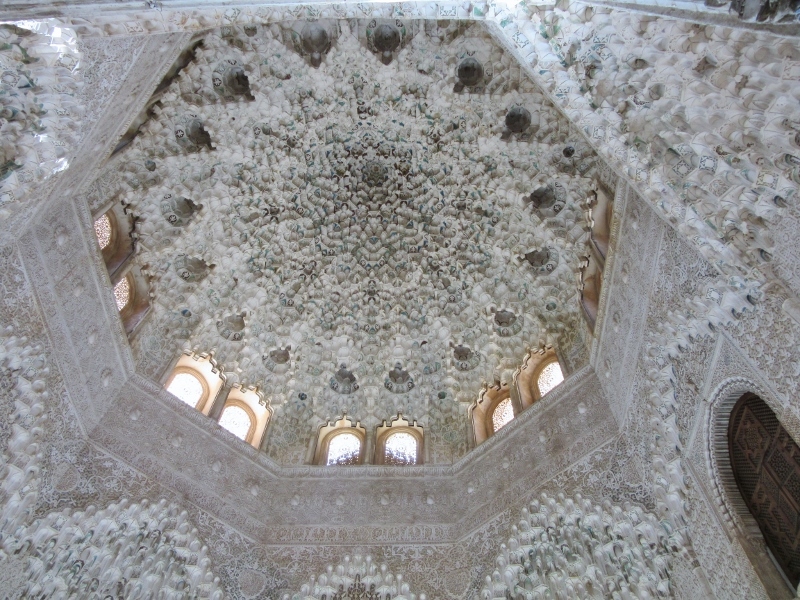 As a result, only a minimum of damage on the periphery was visited upon the Alhambra. 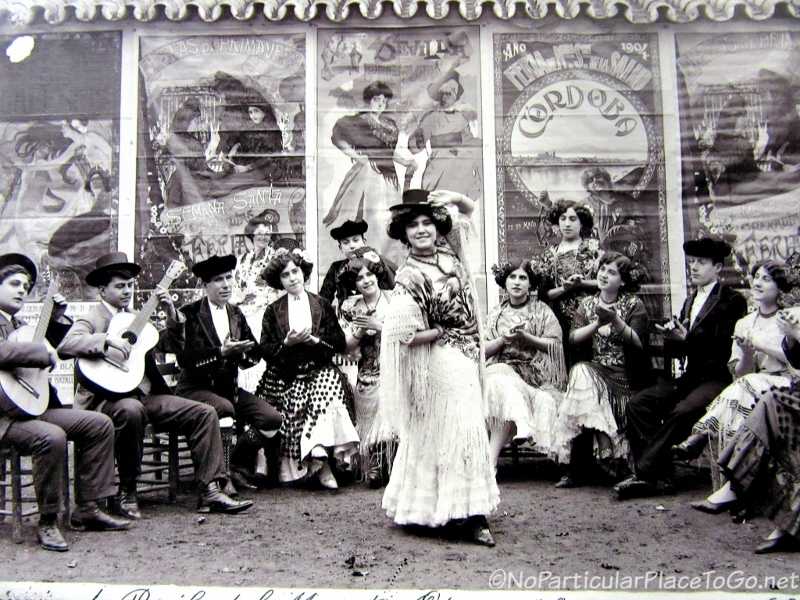 The mighty Alhambra fell on hard times, forgotten and neglected. Squatters set up house. 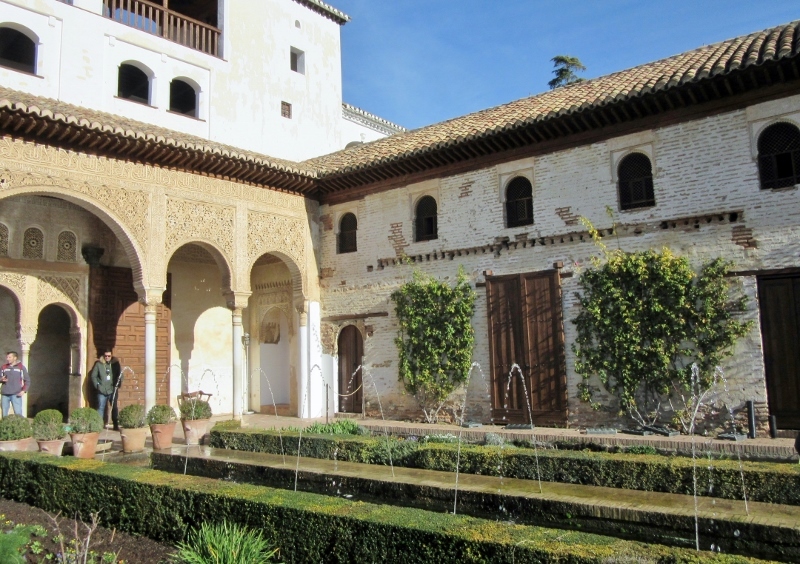 In 1828, after visiting Madrid and writing a tract on his travels and observations, the American author Washington Irving journeyed to Granada where he encountered the Alhambra. 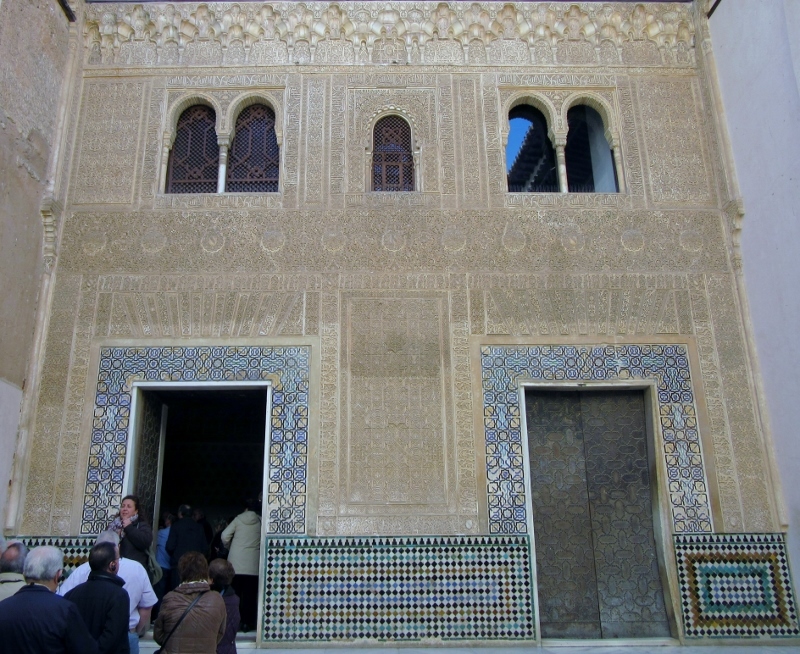 After taking up residence as a kind of “literary squatter” he was inspired by his experience to write “Tales of the Alhambra” which was published in 1832. 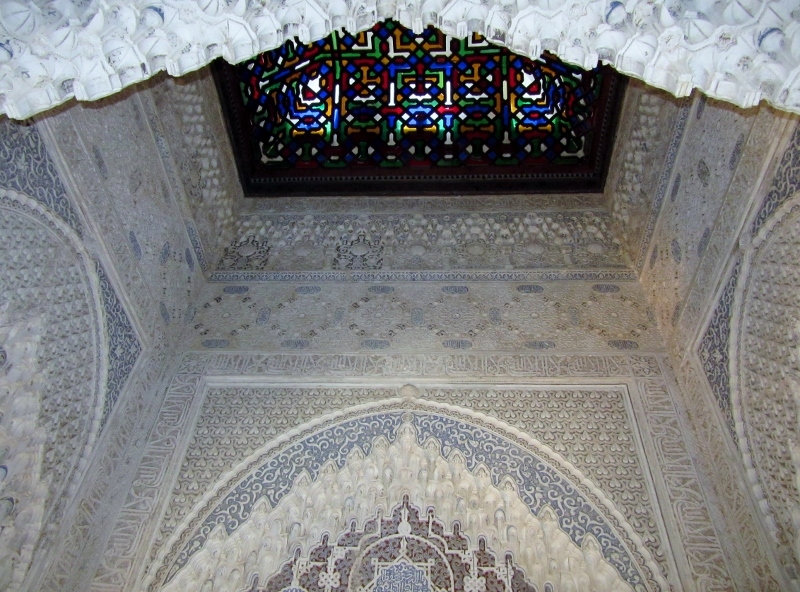 It reintroduced the Alhambra to the West and the renewed interest assisted in the preservation on the Palace. 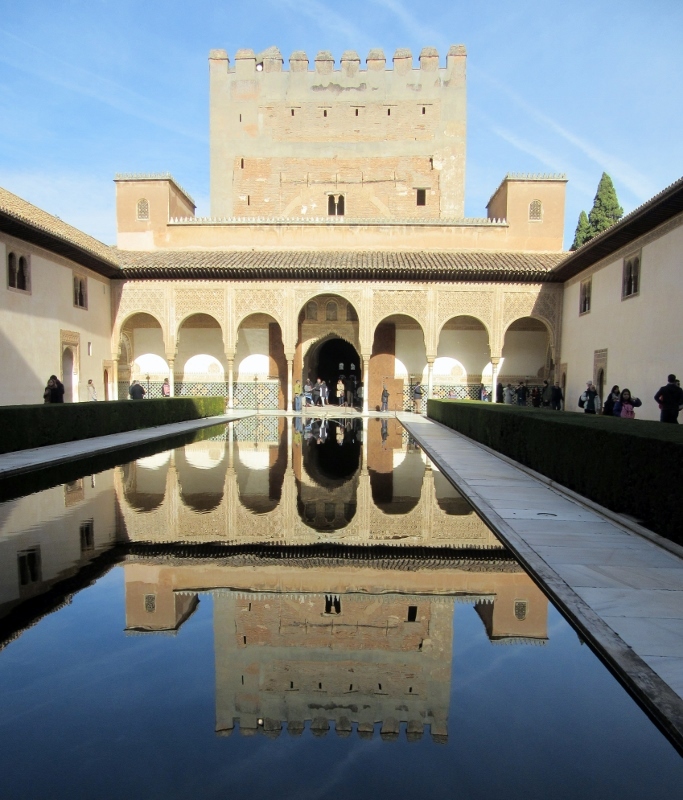 Spain recognized the Alhambra as a national artistic monument and initiated several decrees beginning in 1870 with the goal of preserving the complex. 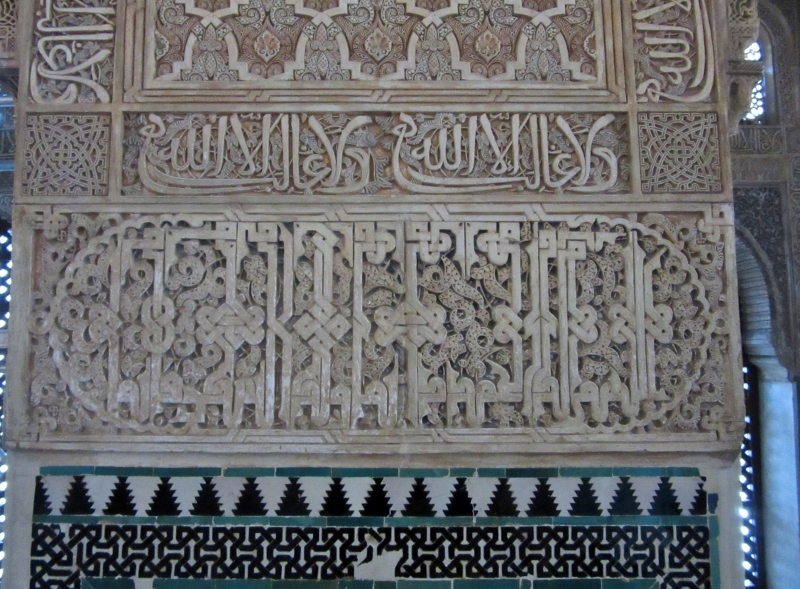 Nothing we had read, none of the photographs we had viewed, none of the conversations with those who had previously been there, could have prepared us for what we encountered at the Alhambra. 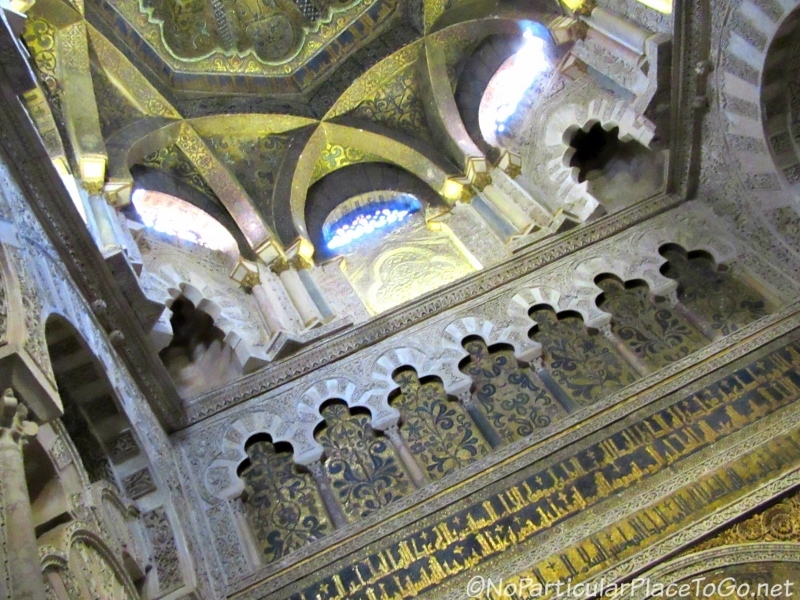 The immensity of the Alhambra cannot be fully appreciated until you are there. The staggering redundancy of beauty, opulence and craftsmanship simply overwhelms the senses. 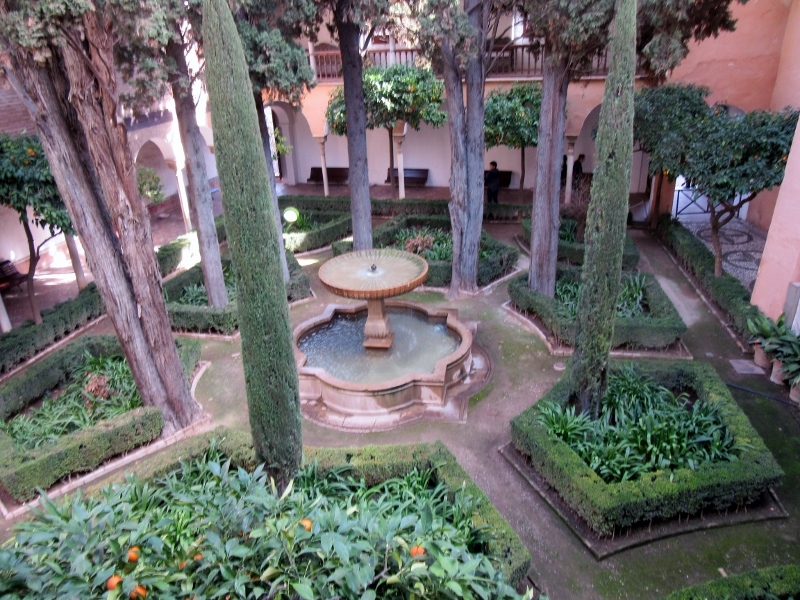 Poets centuries ago called the Alhambra a “Paradise on earth” and we wholeheartedly agree. And after visiting this UNESCO World Heritage Site we suspect that the spirit of Allah still resides among the beauty that was designed to glorify him. Over twenty years ago we voraciously devoured the Ken Follett historical novel “Pillars of the Earth,” a huge volume about a 12th century stonemason who dreams of building a massive cathedral unlike anything seen before. Tom Builder begins his life’s work knowing that it will not be completed in his lifetime but trusting that it will be finished. 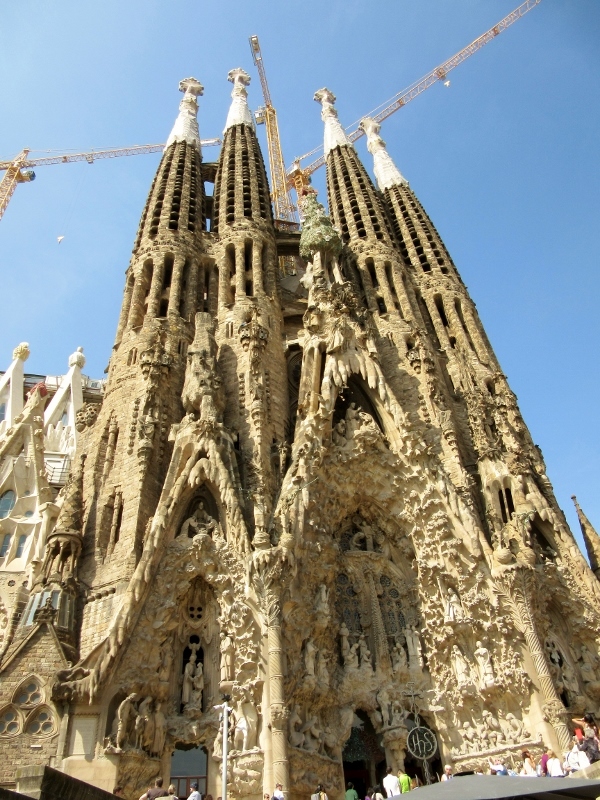 And we couldn’t help but compare this fictional character to the real life Catalan architect, Antoni Gaudi, who collaborated with the Catholic Church to design and oversee the construction of La Sagrada Familia, the most iconic structure in Barcelona. 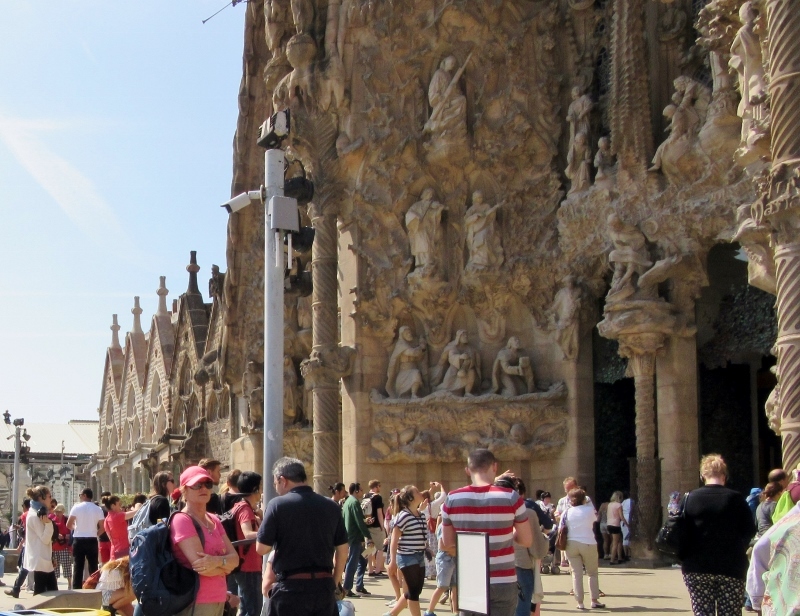 Begun in 1882 and still under construction today, this UNESCO World Heritage Site was consecrated as a minor basilica by Pope Benedict XVI in 2010 and is Barcelona’s number one tourist site, welcoming over 3,000,000 visitors a year. Outside, the cranes tower over the basilica’s spires, plastic sheeting covers parts of the exterior and everywhere, throngs of people stand: in long lines behind the gates, shorter lines awaiting admittance with their e-tickets, s-curved lines at the stands for audio headsets and lines awaiting entrance into the church itself. 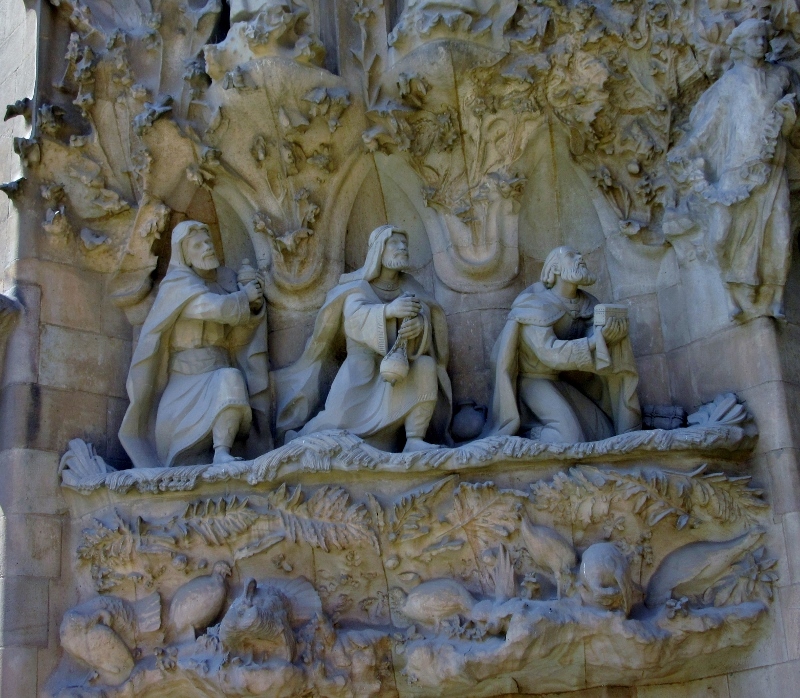 Those not in lines gather alongside the walls with their heads tipped back and looking up, up, up, examining the carvings and sculptures, stories in stone, cameras clicking. And inside … We join the throng of people surging into the central nave and extricate ourselves as quickly as possible to stand quietly for a few moments trying to absorb the vast space. Organ music swells in the background and reverberates around us, voices are muted and there is the sound of shuffling feet. We are awestruck. Above us the giant, tree-like pillars reach from earth to heaven, branches touching and supporting the spectacular vaulted ceiling. 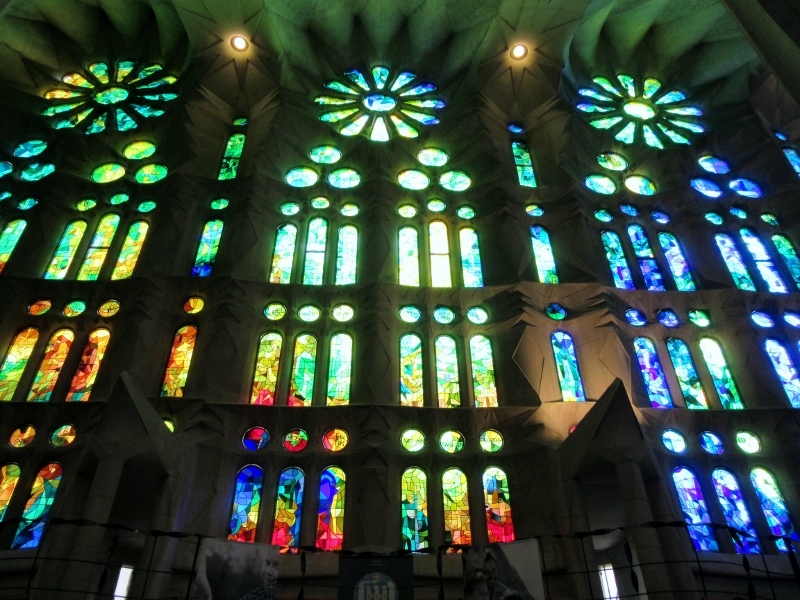 Light filters in from enormous panels of stained glass through the branches and pillars of granite, basalt, porphyry and Montjuïc stone. The noise from the crowd fades and we are in nature’s hallowed forest. 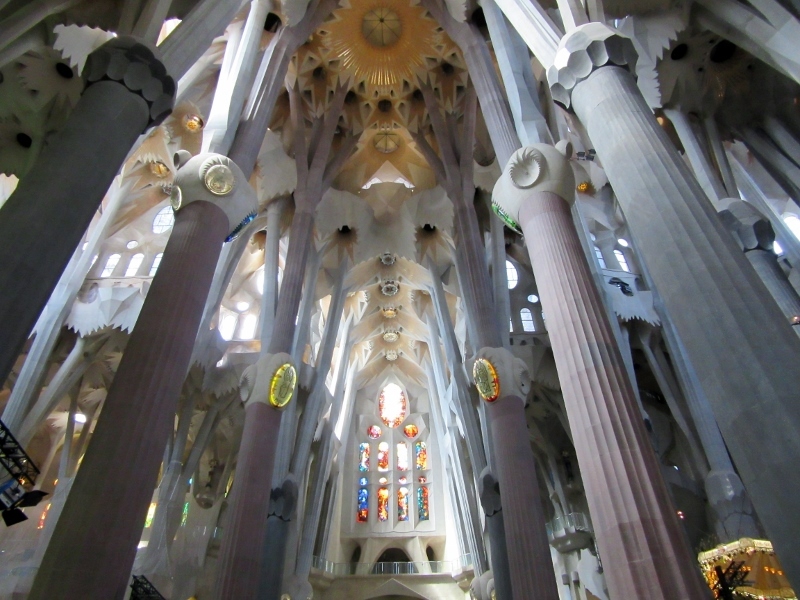 Much has been written of La Sagrada Familia, Antoni Gaudí’s final work and all-consuming obsession. Gaudi, like the fictionalized stonemason of “Pillars of The Earth” was well aware that he would never live to see his life’s work completed and is said to have remarked, “My client is not in a hurry.” At the time of his death in 1926 the church was approximately twenty percent completed and construction was expected to last for a few more centuries in a time when all stone was carved by hand. 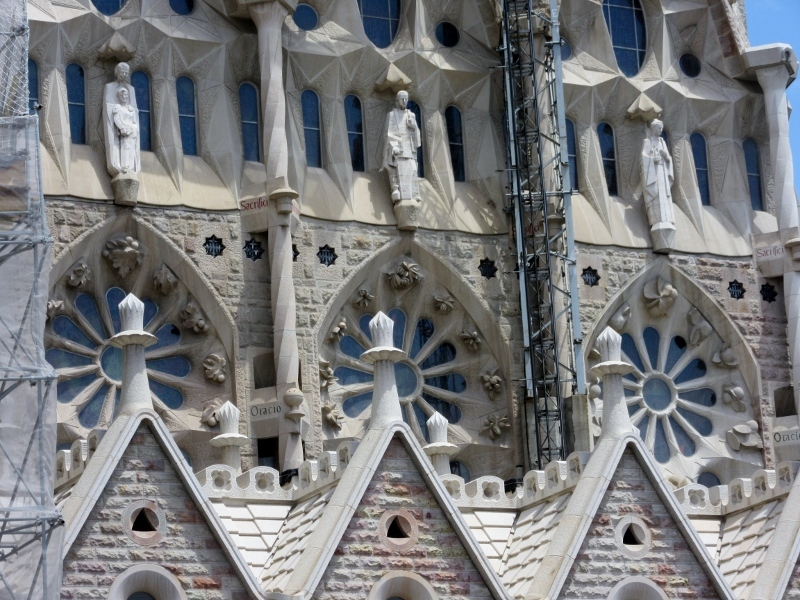 With advances in technology, machines to shape and tool the stone and computer-aided design, the hope is to finish the basilica in 2026, a century after Gaudi’s death. 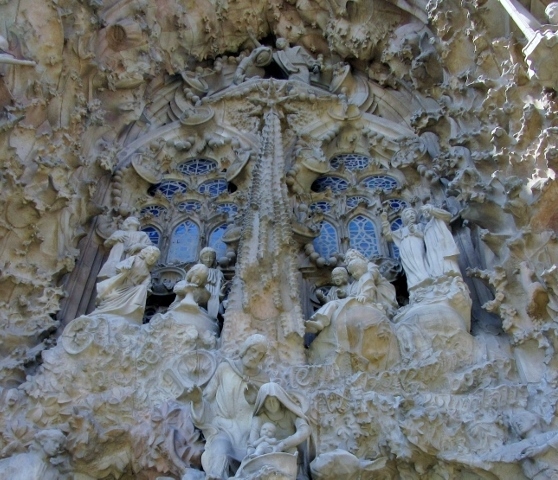 Private benefactors sponsored the initial construction and Gaudi contributed his own money as well. 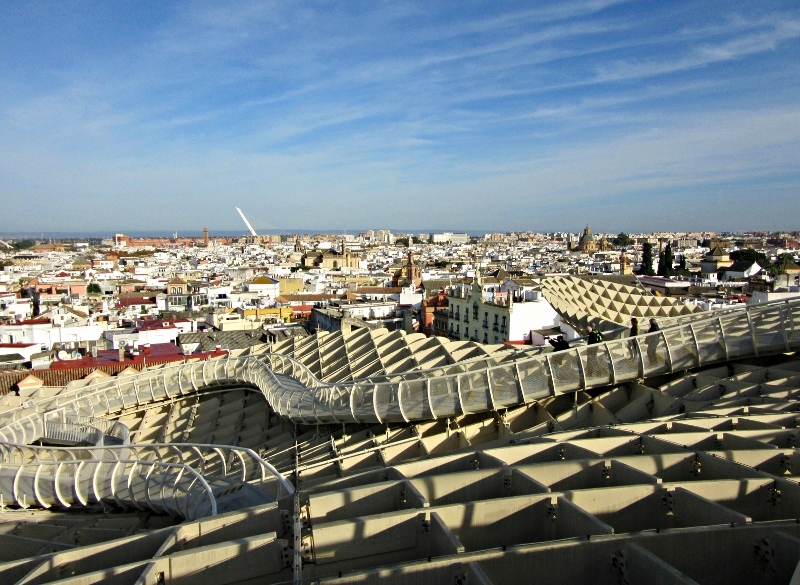 At present the money received from ticket sales as well as donations from Friends of La Sagrada Família fund the continuing work at the site. Perhaps a highlight of our almost two-hour visit was the organ recital at noon of Ave Maria. We were totally moved as we stood in the sublime surroundings of the central nave. For people who profess no religious affiliations or interest we seem to find ourselves in churches and cathedrals rather often during the course of our travels. Churches are often the place where a city displays its best architecture and art and the structure becomes linked with both a city’s history and identity. 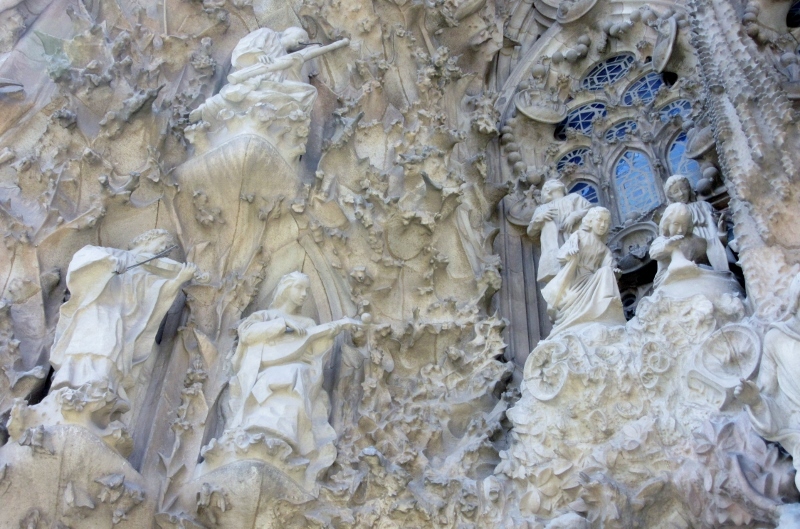 This most certainly is true as La Sagrada Familia has become Barcelona’s signature emblem.